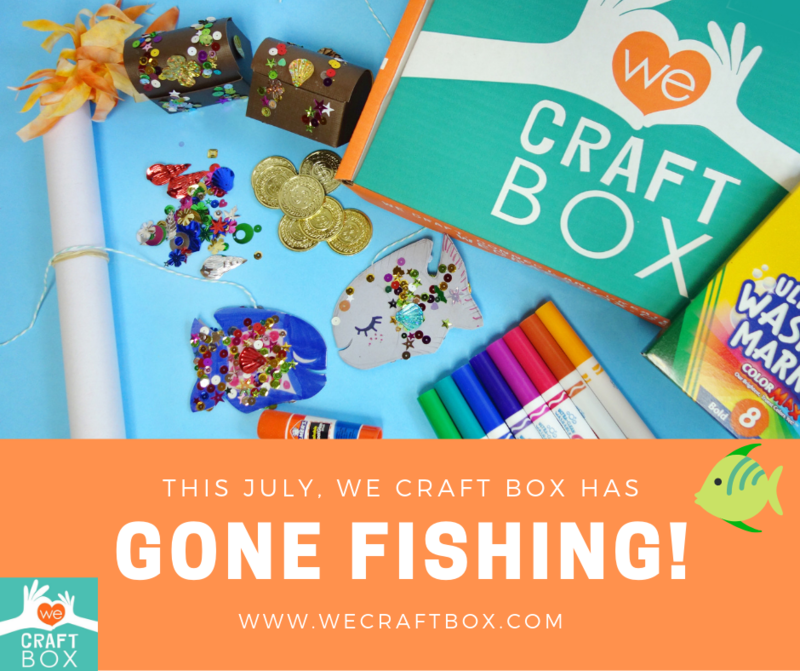 We Craft Box Goes Fishing in July for Some Fun Crafts! 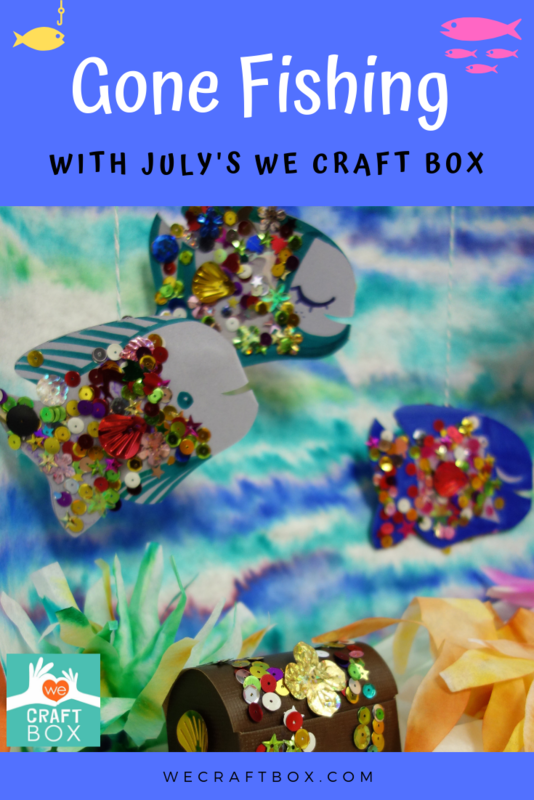 We Craft Box is going fishing in July with these special sparkle fish! 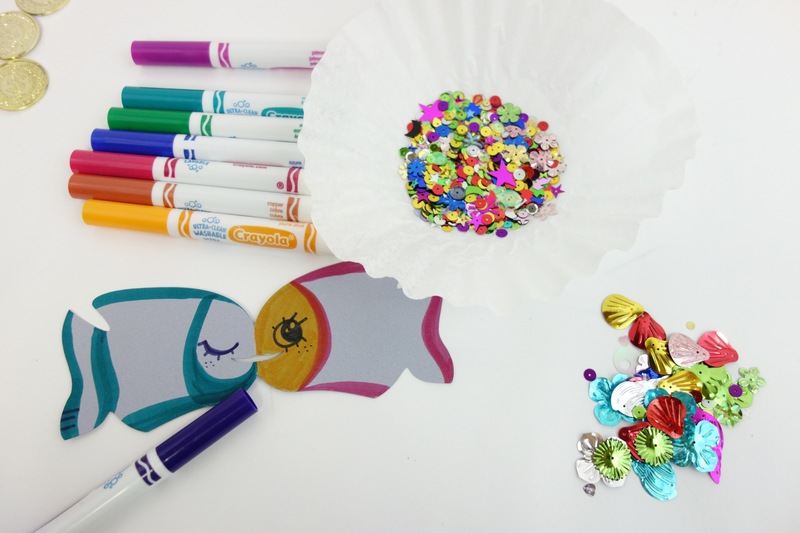 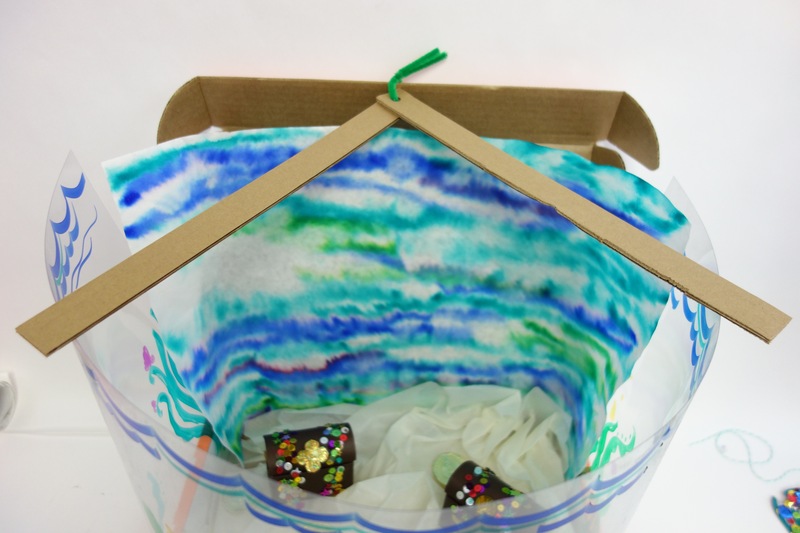 Some of the special materials we used this month include sparkles, sequins, and coffee filters. 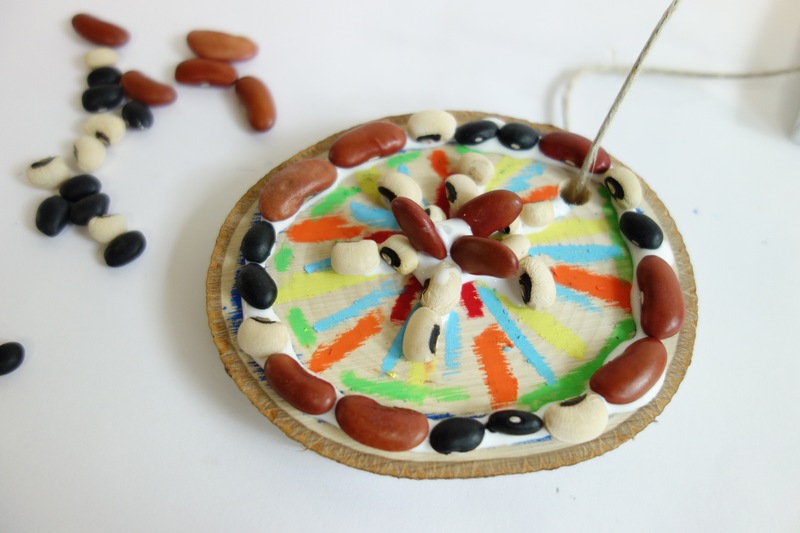 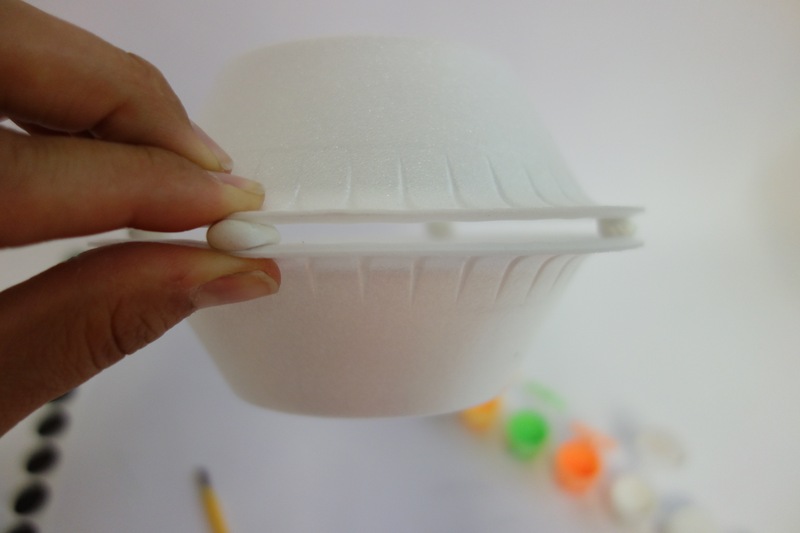 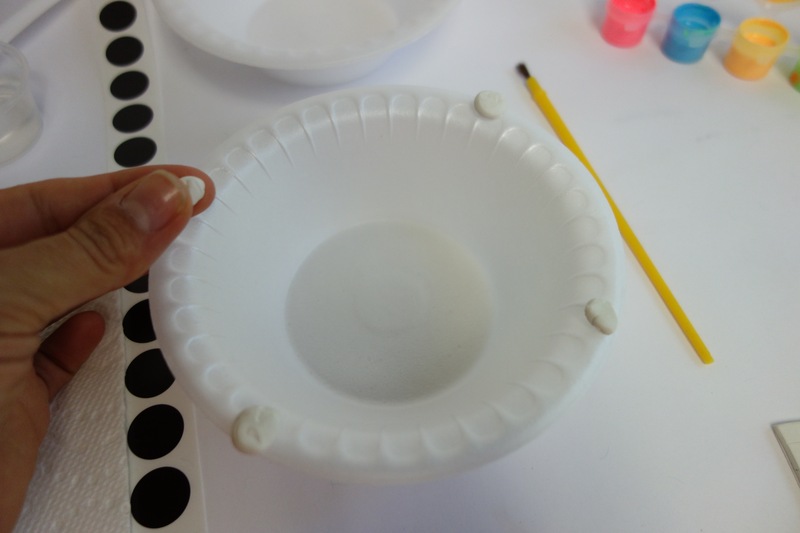 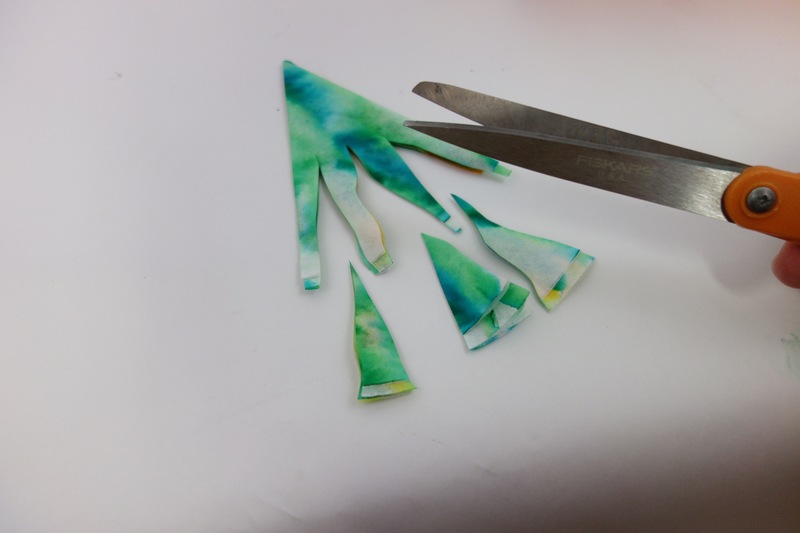 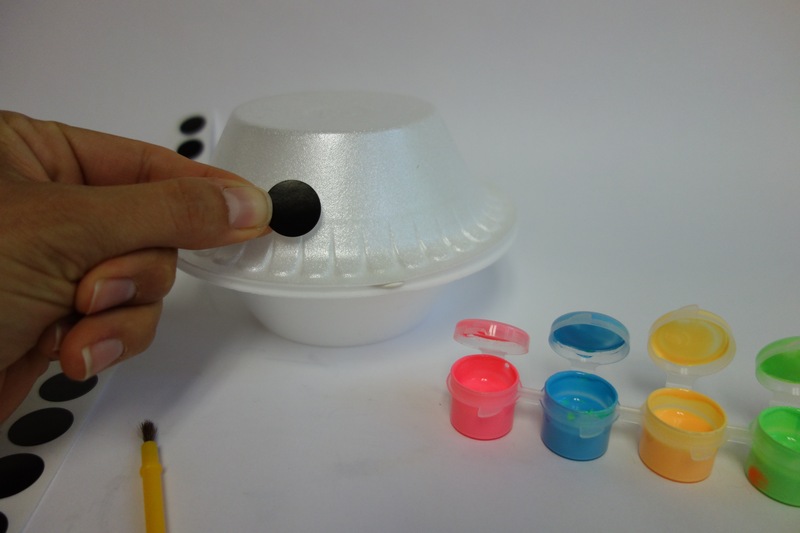 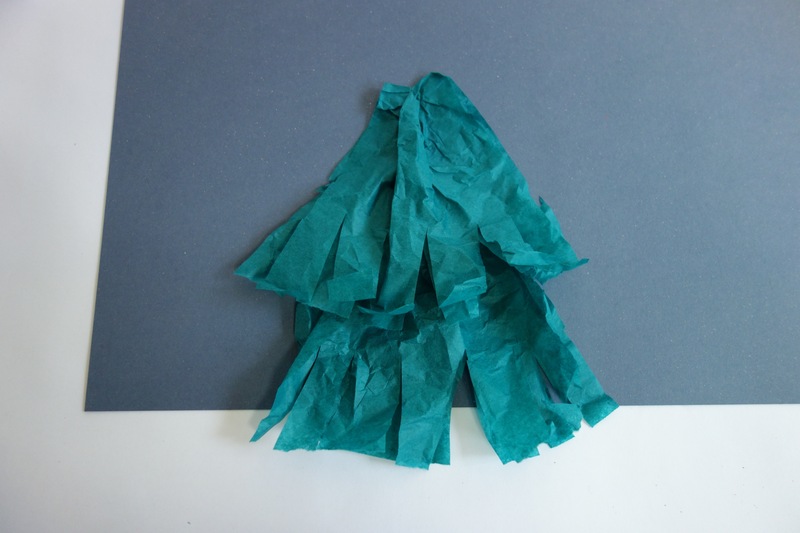 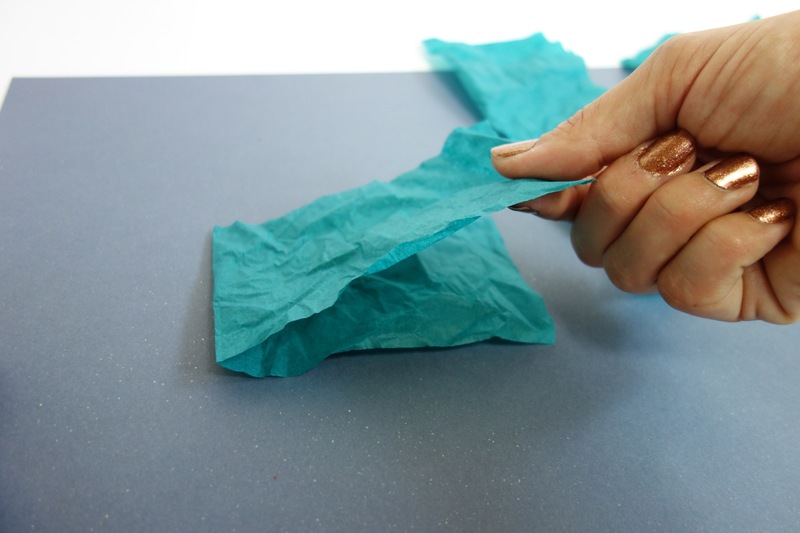 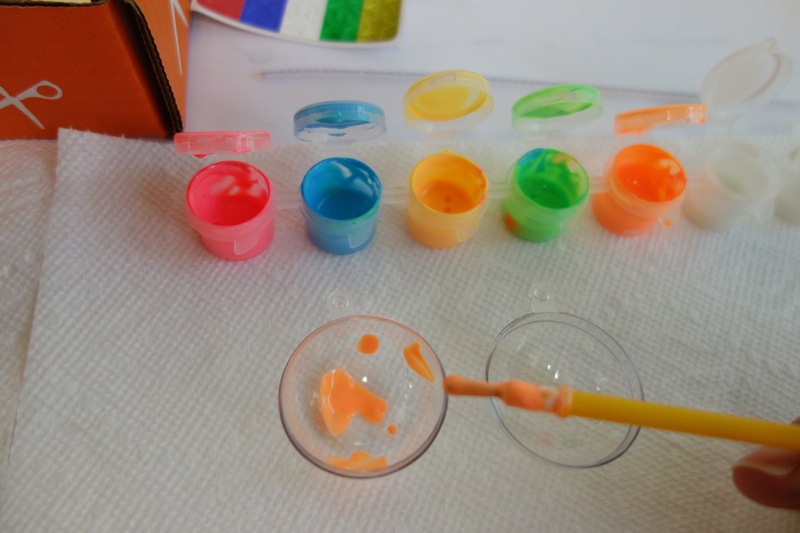 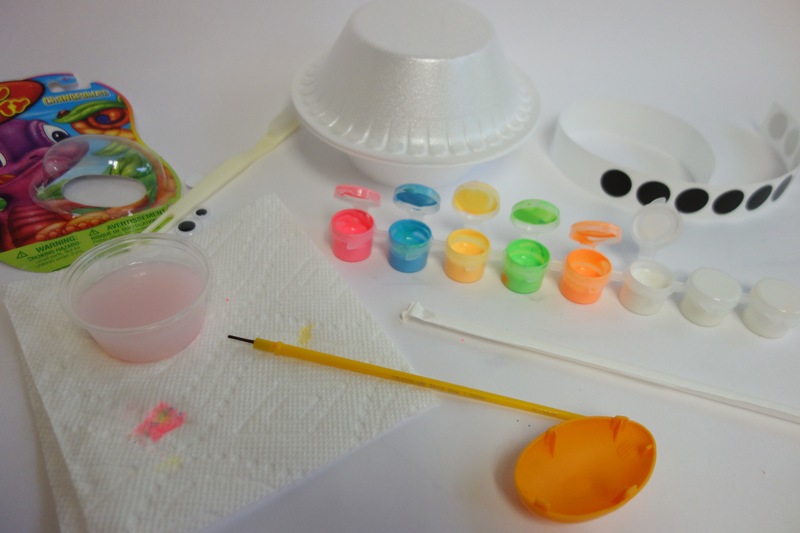 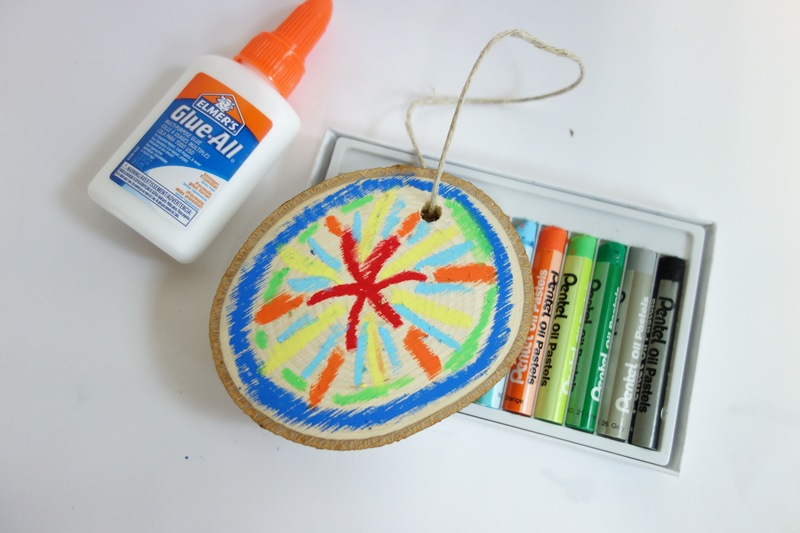 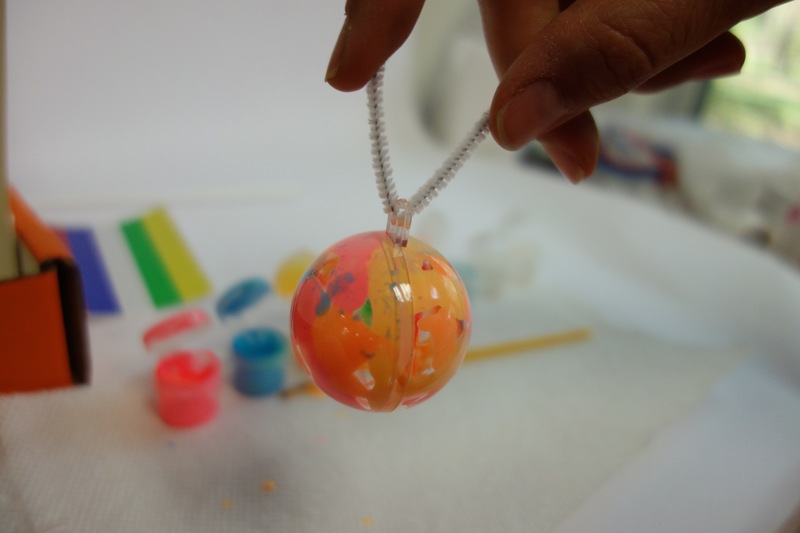 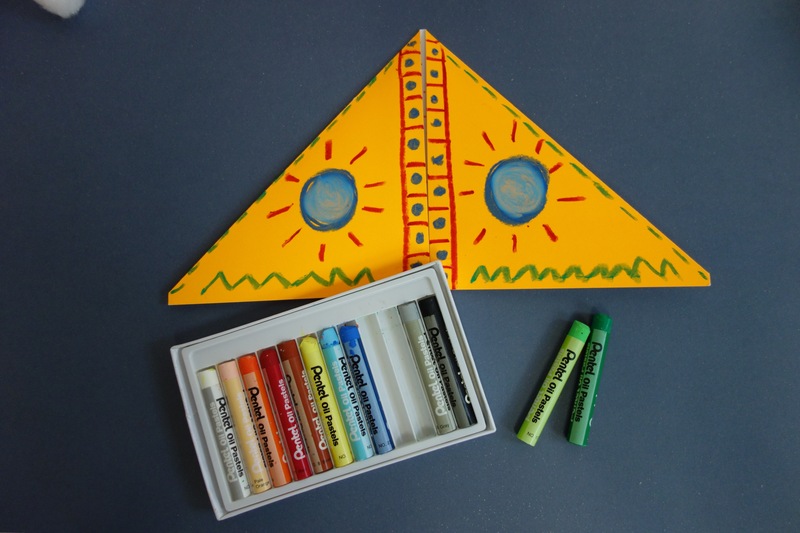 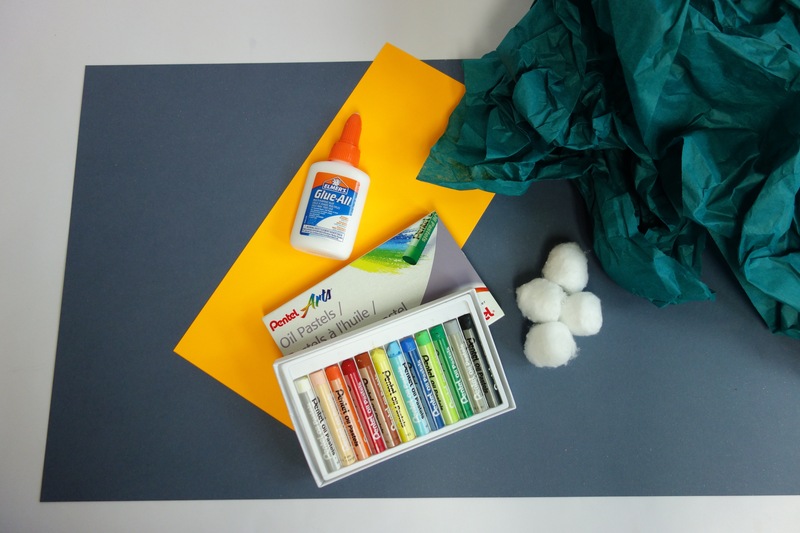 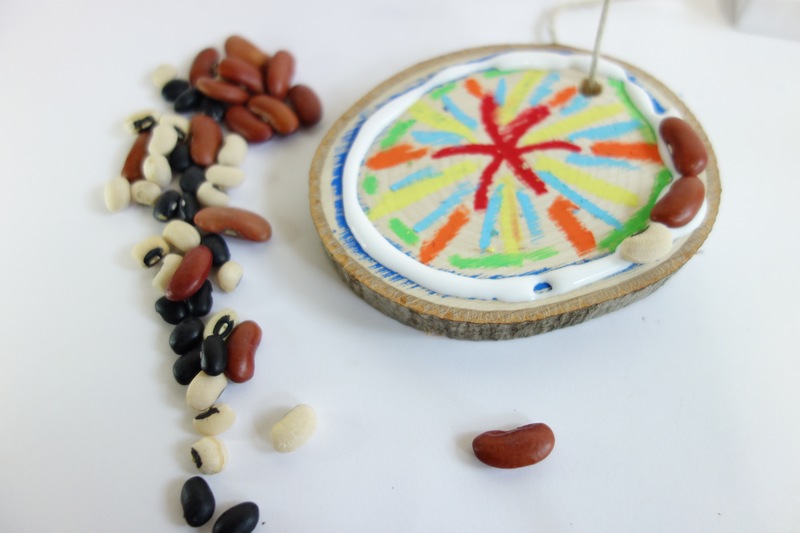 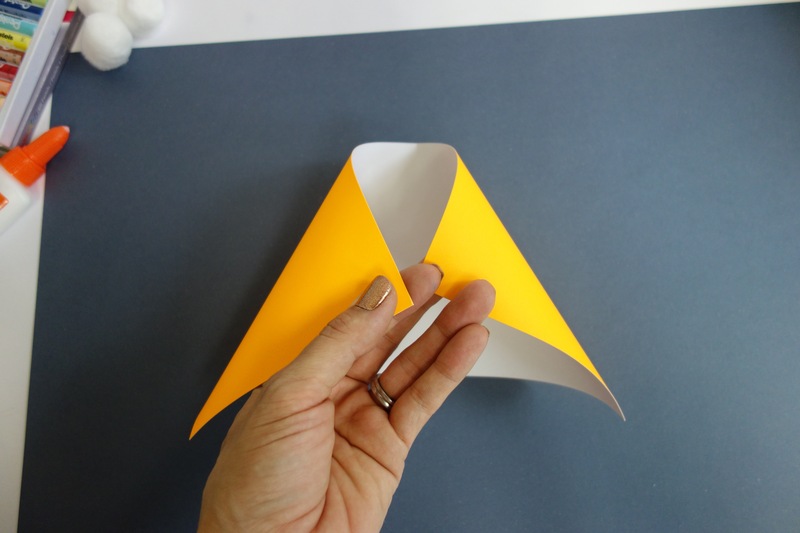 All of these fun materials turned out to be a bright and fun craft for the kiddos to enjoy. 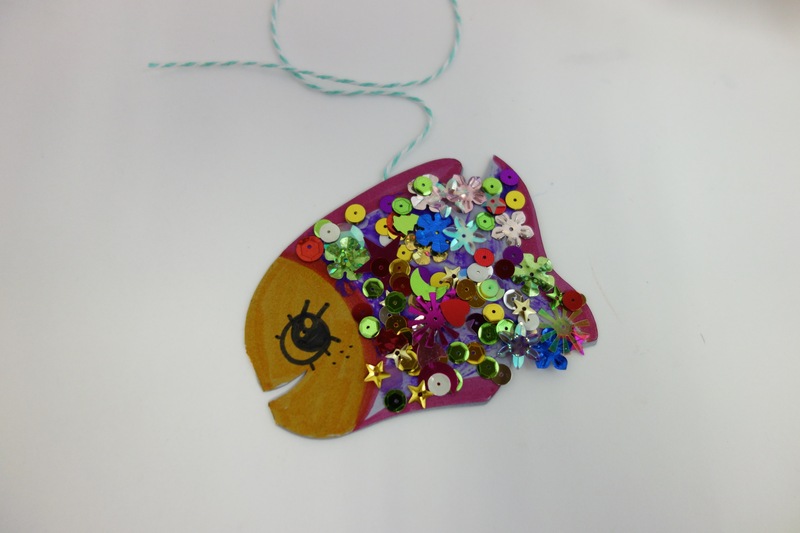 We started crafting our underwater world by making our sparkle fish. 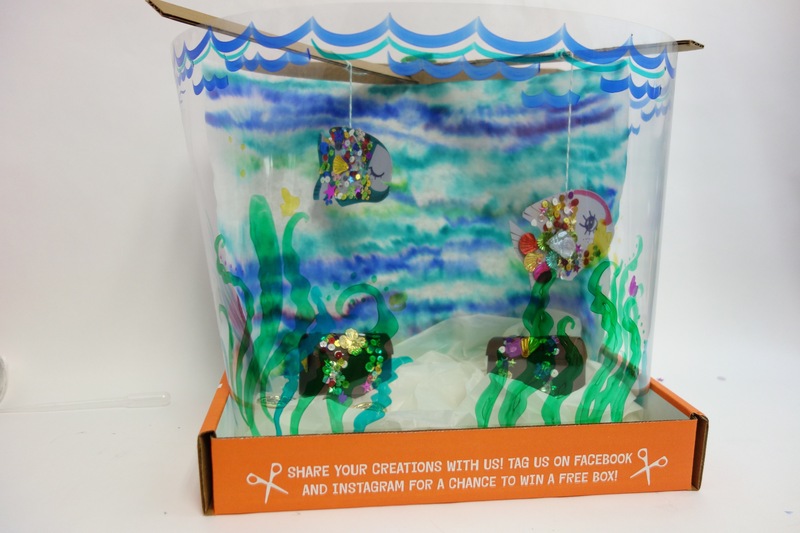 Now that we have some sparkly fish friends to occupy our underwater world, we have to create some hidden treasure chests for the sparkly fish to protect. 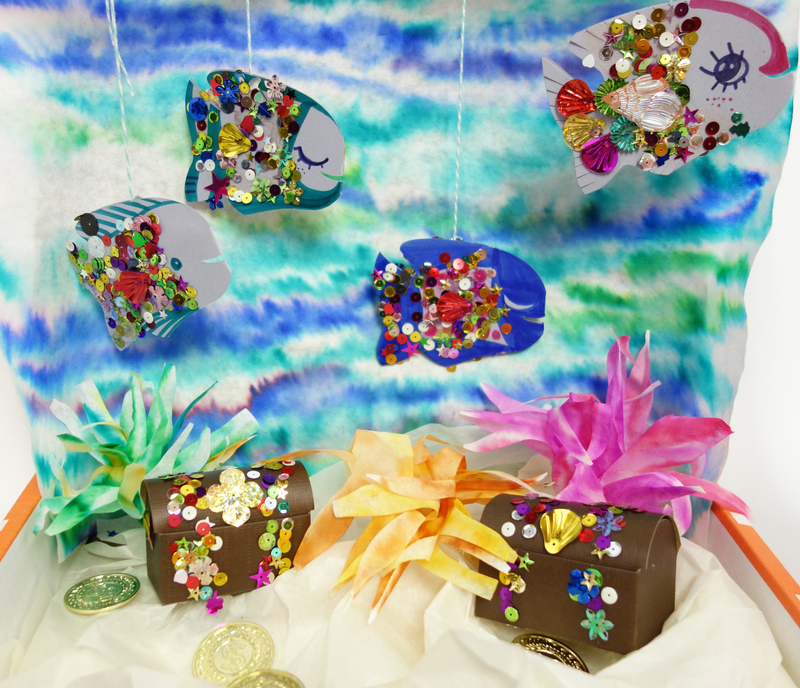 Now that we have secret treasure chests for the sparkly fish to swim around, we need to create our underwater world for the fish to live in. 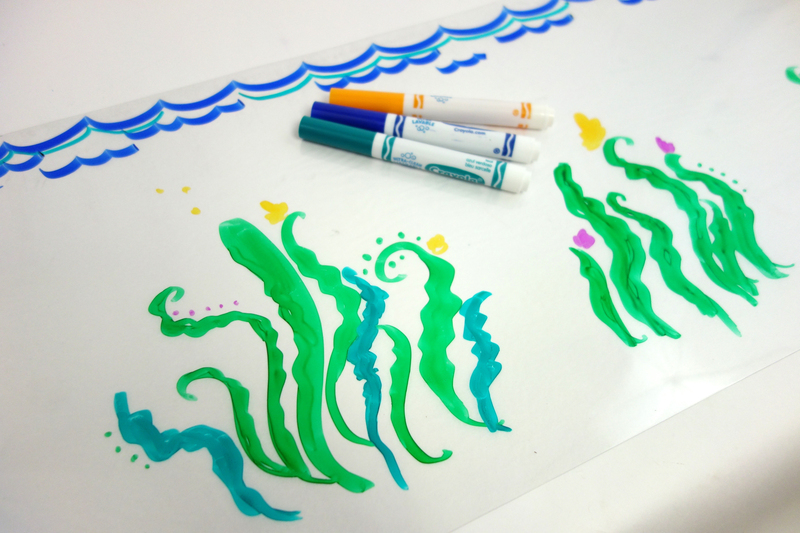 After we finish the underwater world we will be able to watch our fish swim together in their new tank! 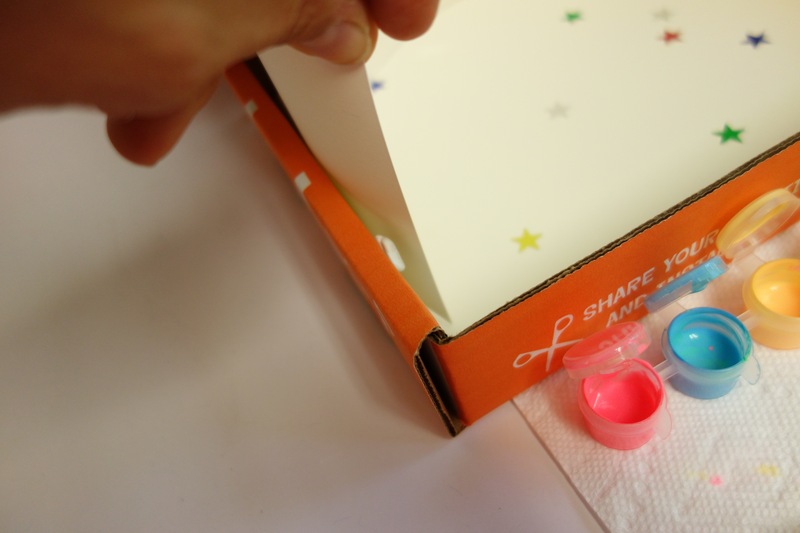 This is the clear outer layer of the tank. 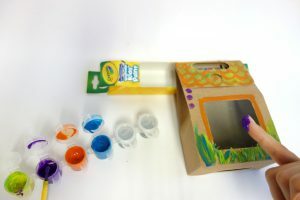 We added some fun plants and blue streaks that looks like water inside the tank. 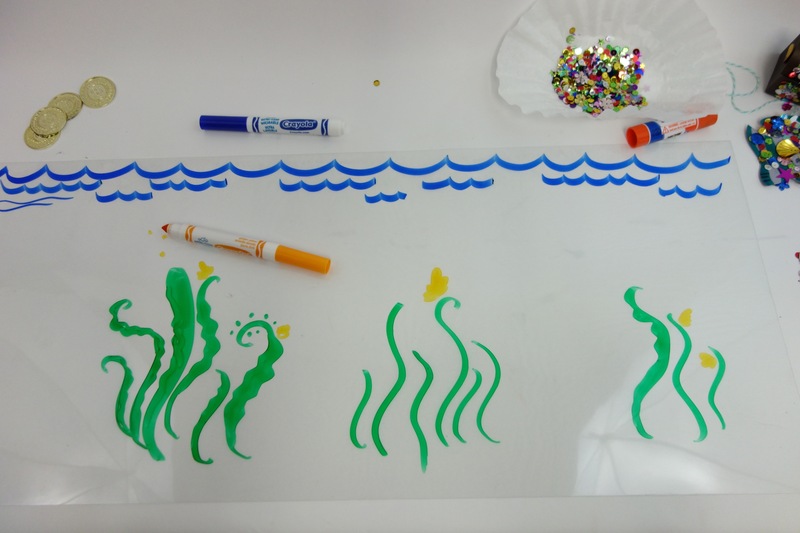 This is the fish tank background we made so it would look like our sparkly fish are swimming under water. 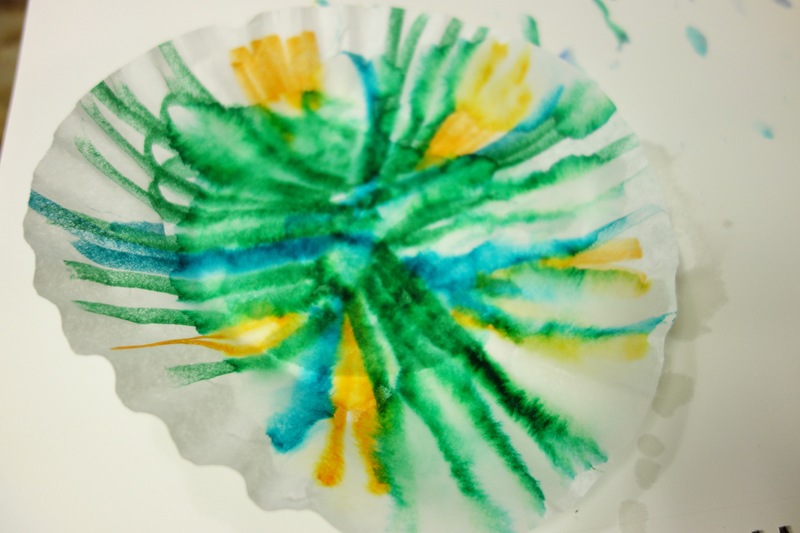 We also colored and cut up some coffee filters so they would look like plants for the fish tank for our sparkly fish to swim through. 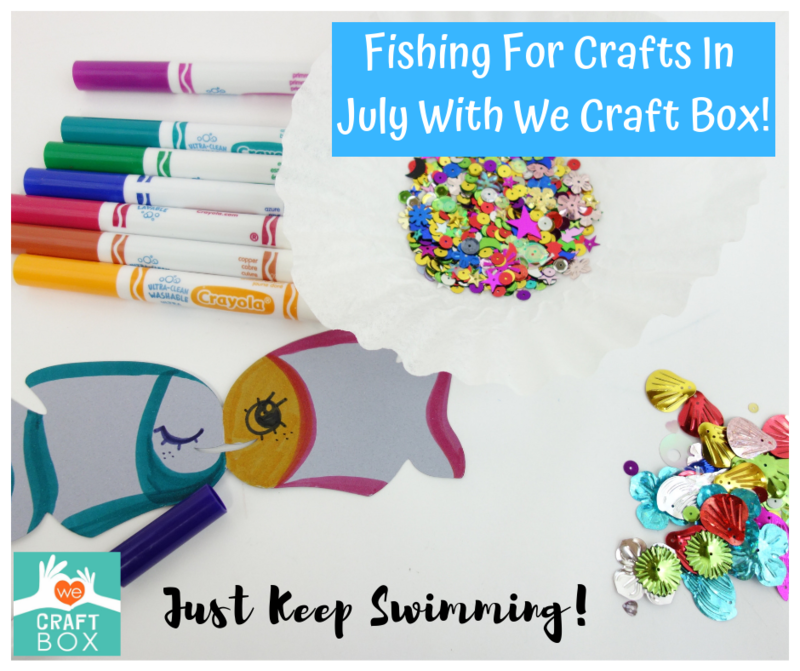 For the last part of our fishing journey, we go to put our sparkly fish on some string and hang them from the top of our We Craft Box so they could swim freely in their new underwater world. 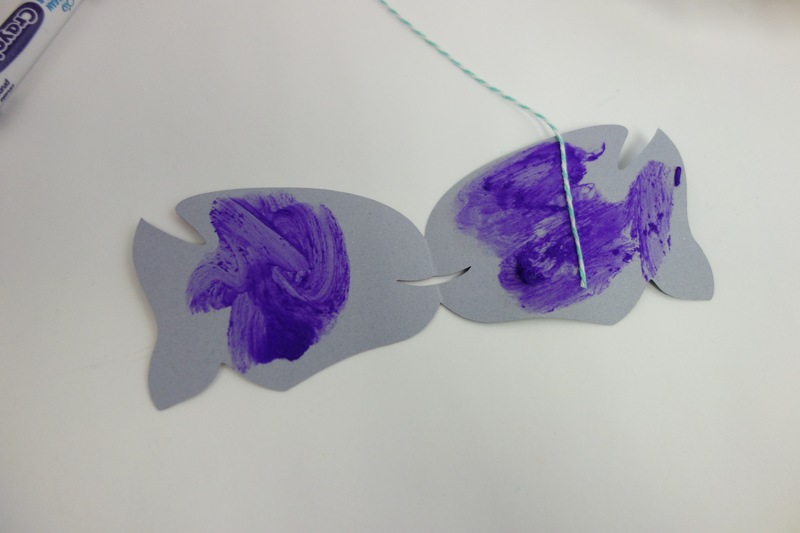 Thank you for coming on this fishing journey with us! 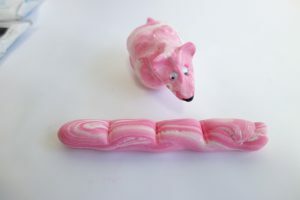 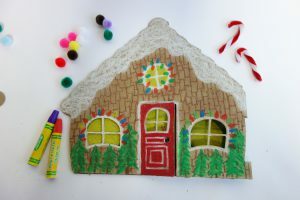 If you would like to do similar crafts like this one, look at our available subscription options online at www.wecraftbox.com. 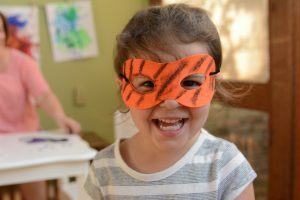 You and the kiddos will not regret it! 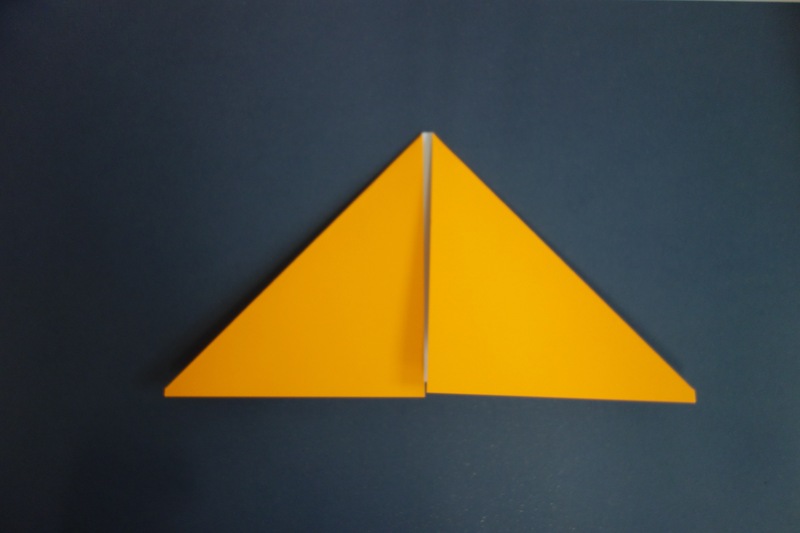 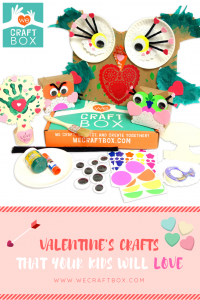 Author Meg FisterPosted on February 14, 2019 March 28, 2019 Categories Past BoxesTags crafts, diy, fish, fishtank, fun, happy, july, kidscrafts, lifestyle, momblog, mommyblogger, subscriptionboxLeave a comment on We Craft Box Goes Fishing in July for Some Fun Crafts! 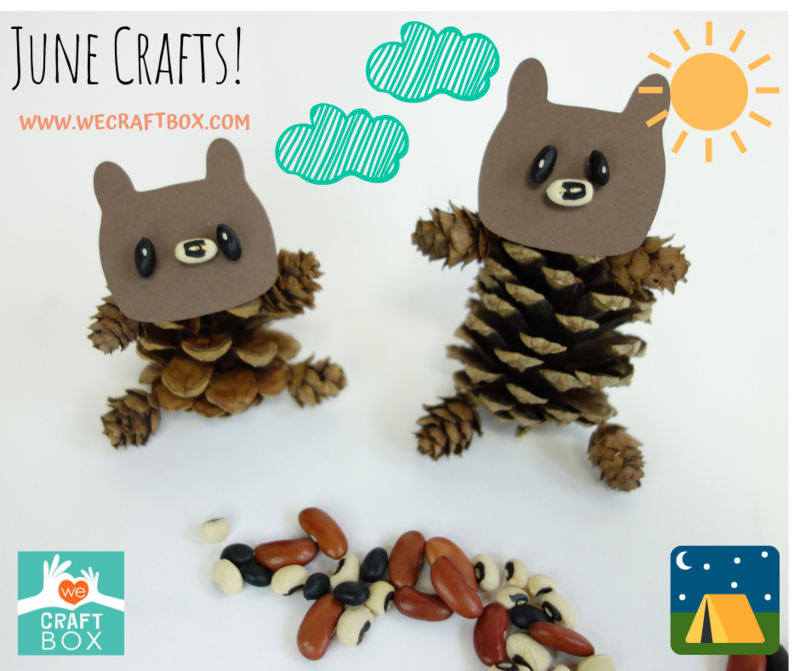 Setting Up Camp in June with the We Craft Box Camping Bears! 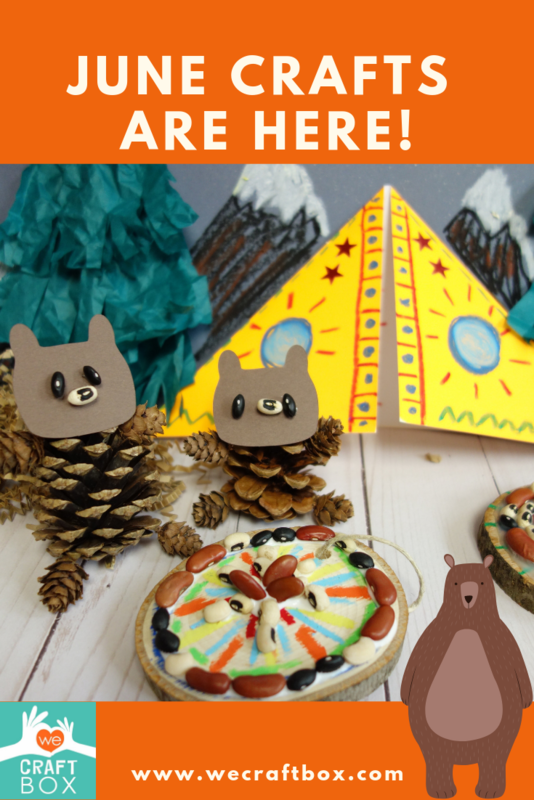 We set up camp in June with our camping bear friends! 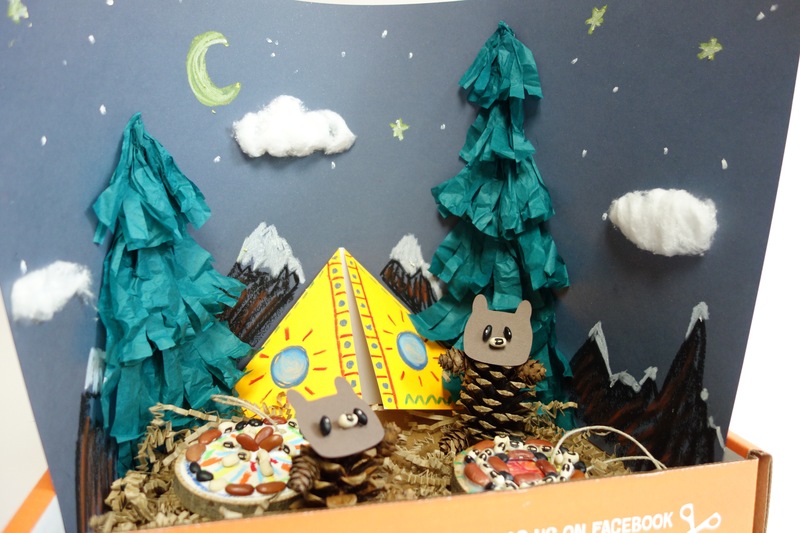 This camping scene was super fun to make and it turned out adorable. 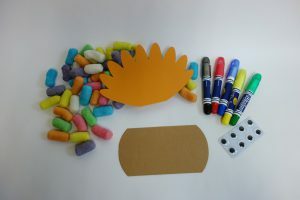 In the month of June we got to work with some fun materials like pine cones, beans, and oil pastels! 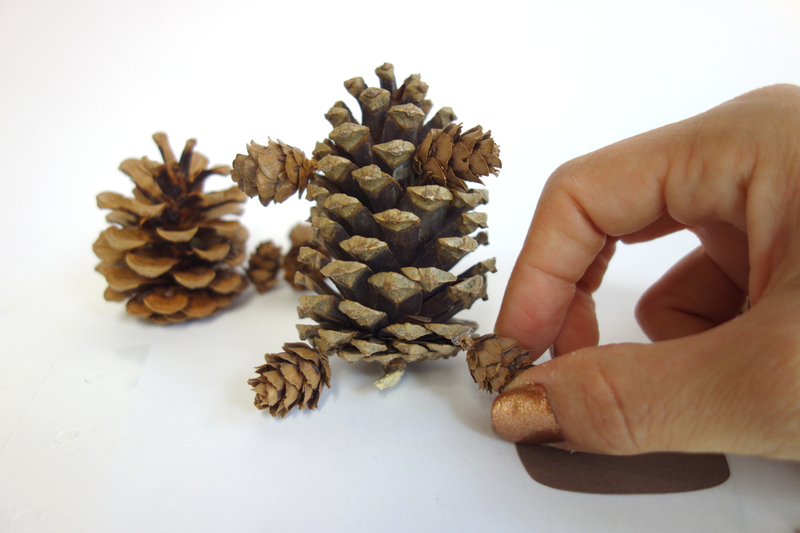 The first step in our camping journey was to make the camping bears! 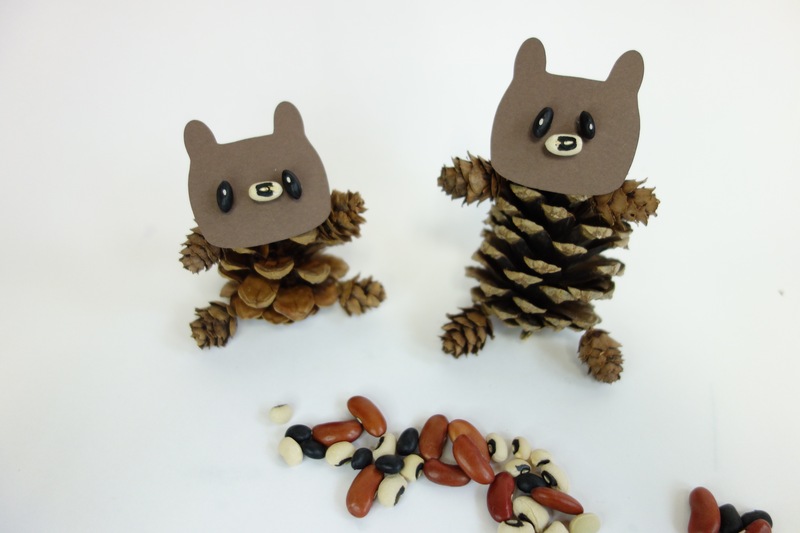 These bears were simple to make! 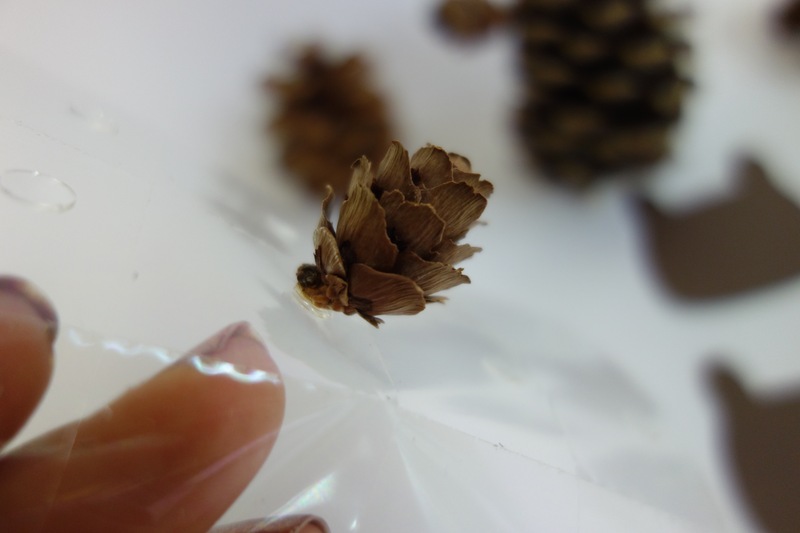 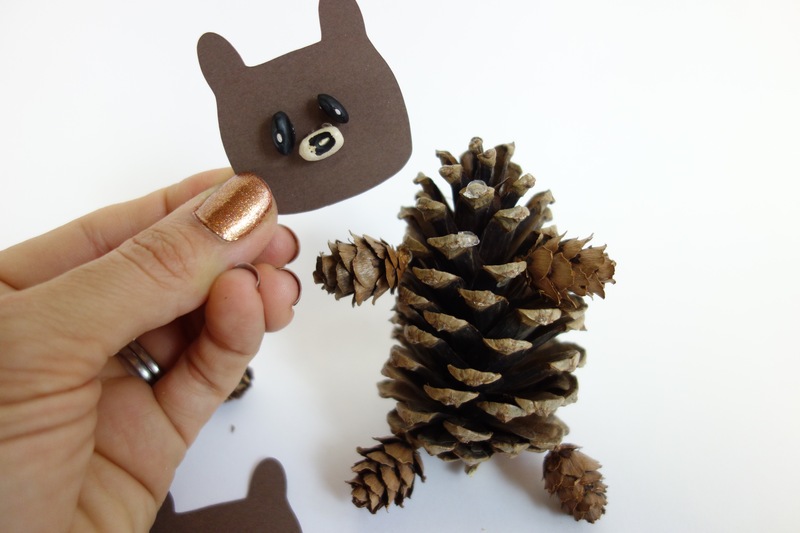 Attaching the pinecones together for the body and using a paper bear head, our new friends turned out so cute it was unBEARable. 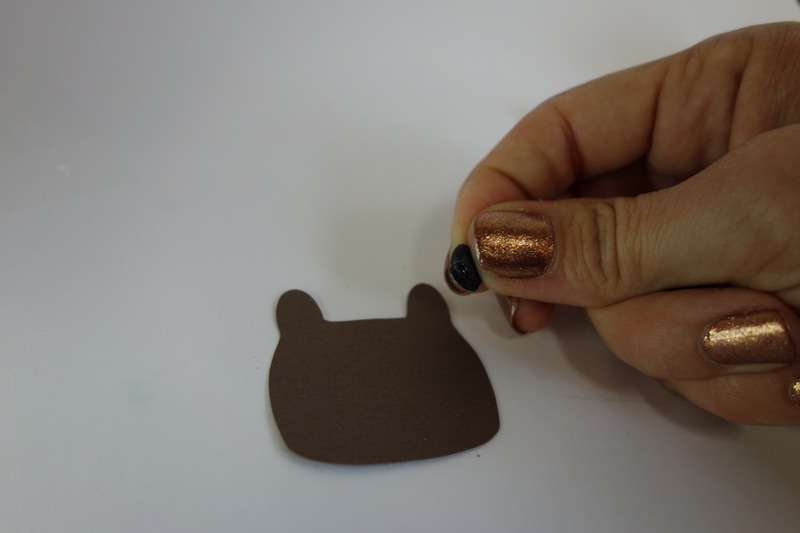 We then were able to add some beans to the face, which gave the bears their quirky personality. 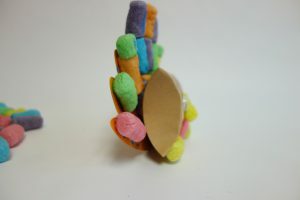 Now that we had our bears we moved on to making our campfire! 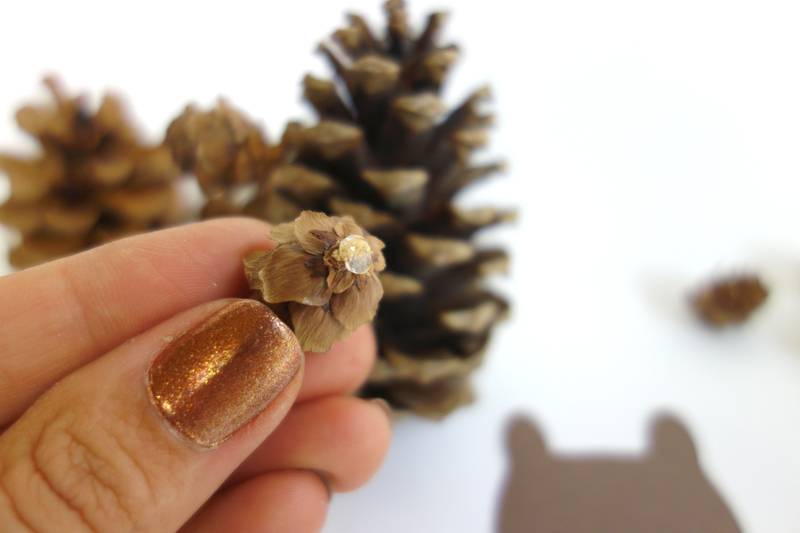 The best part about this campfire is that it doubles as an ornament. 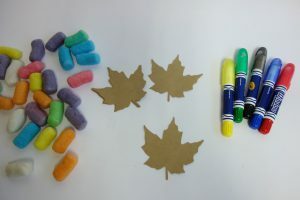 With a few oil pastels, glue and some beans, we had a nice and toasty campfire for our bear friends to enjoy! 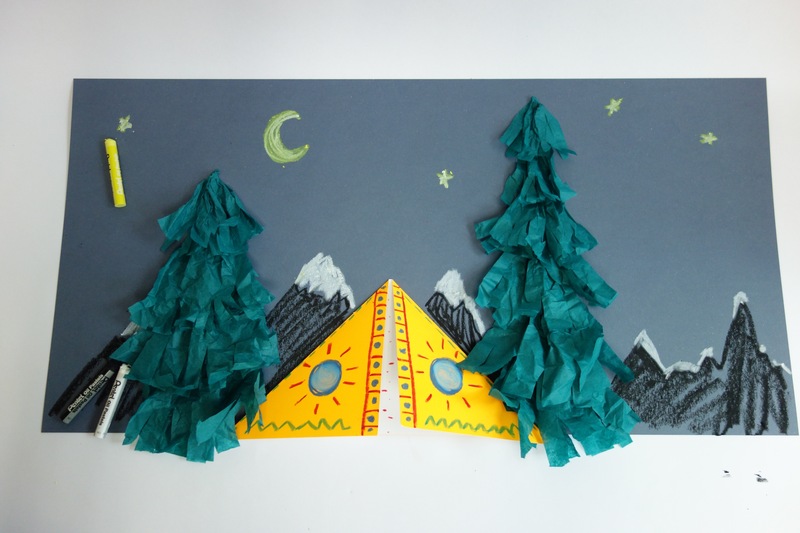 We finally ended our camping trip with the bears by pitching the tents and staring out into the stars. 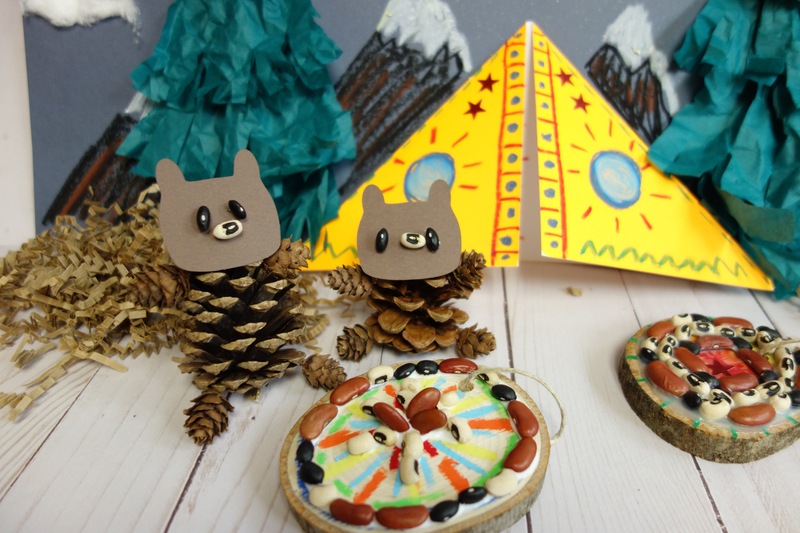 Our bear friends had an amazing time in the great outdoors! 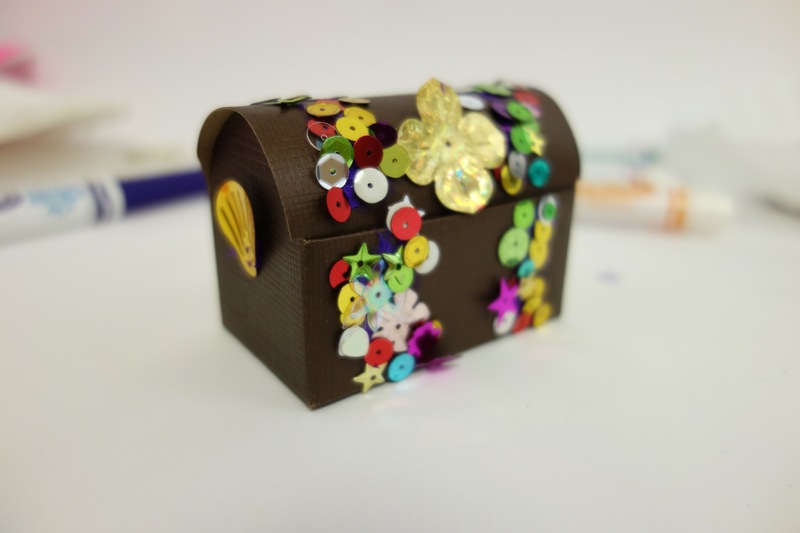 We Craft Box also had a great time crafting our bear friends and their camping scene. 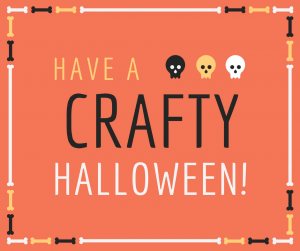 Thanks for coming camping with us and be sure to stay tuned for our next crafting journey! 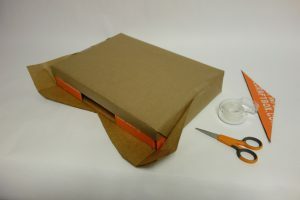 If you are interested in doing more crafts like these, visit www.wecraftbox.com. 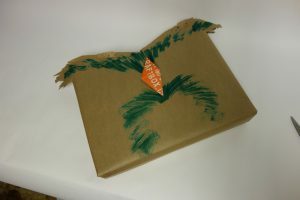 To see an unboxing video of May’s box, click the video down below! 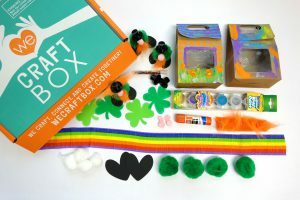 Author Meg FisterPosted on February 2, 2019 Categories Past BoxesLeave a comment on Setting Up Camp in June with the We Craft Box Camping Bears! 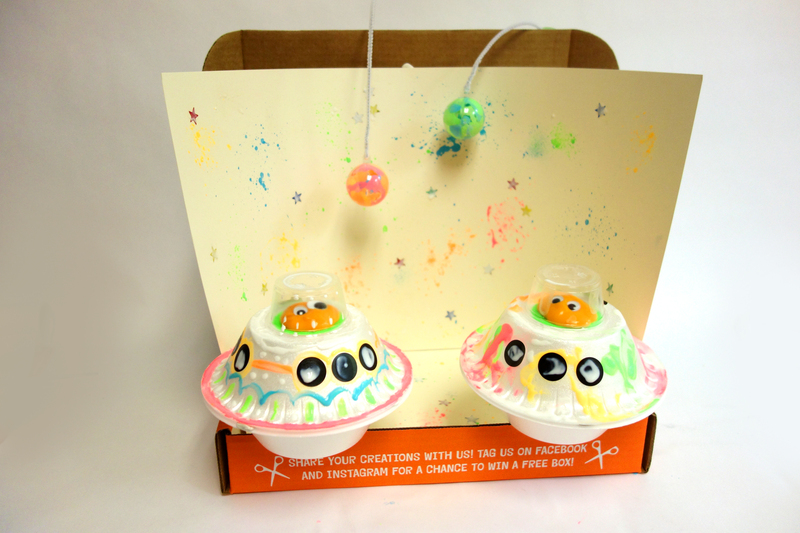 May’s Crafts Are Out of This World! 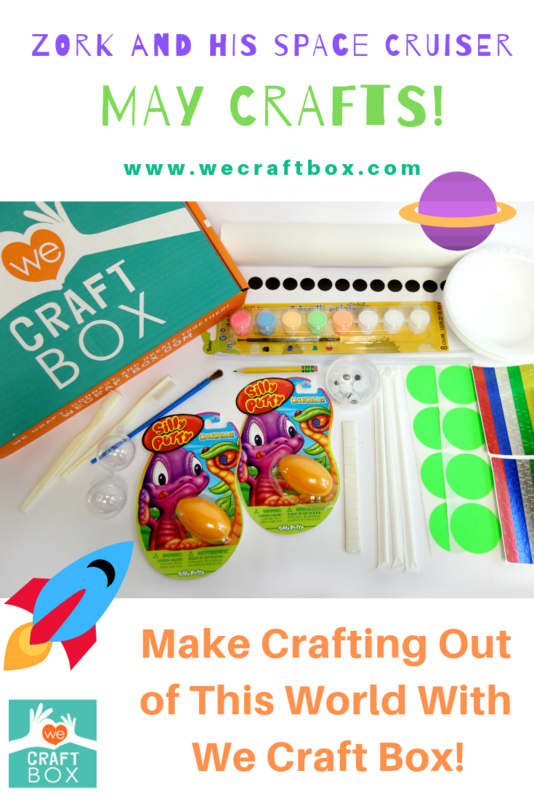 Prepared to be blown out of this world with May’s We Craft Box! 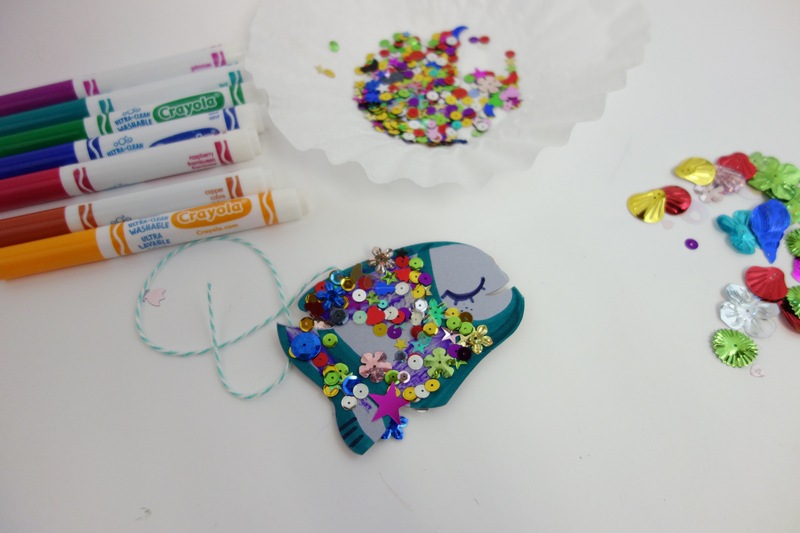 In May, we got to meet some new friends and the crafts were extra space-cial. 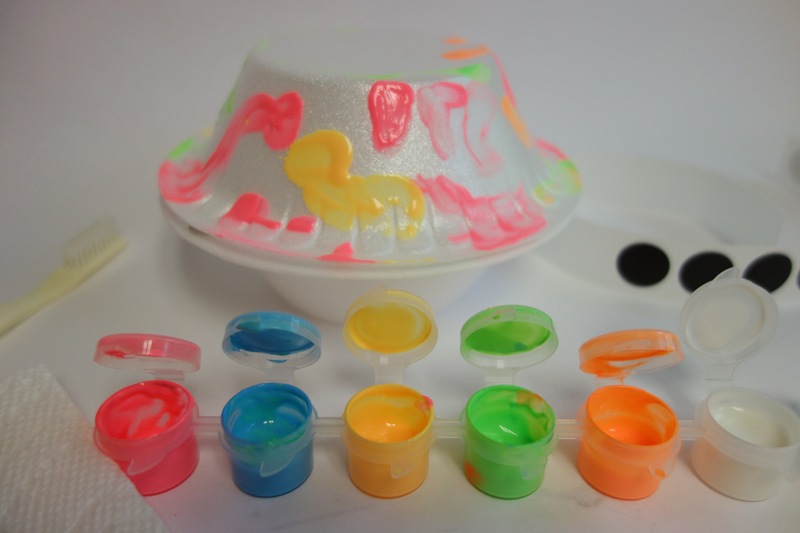 This month we got to work with some fun materials like silly putty and glow paint! 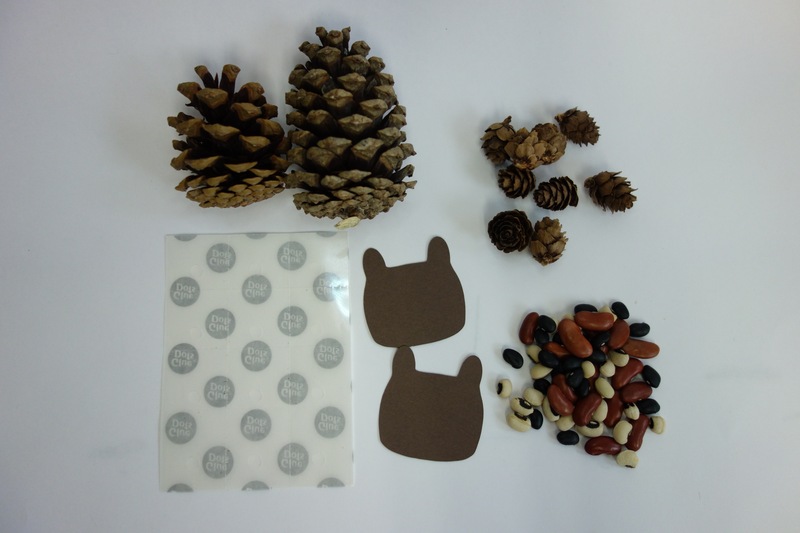 These are all of the materials needed, which are all included in the subscription box. 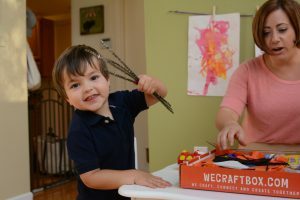 This makes crafting easy peasy! 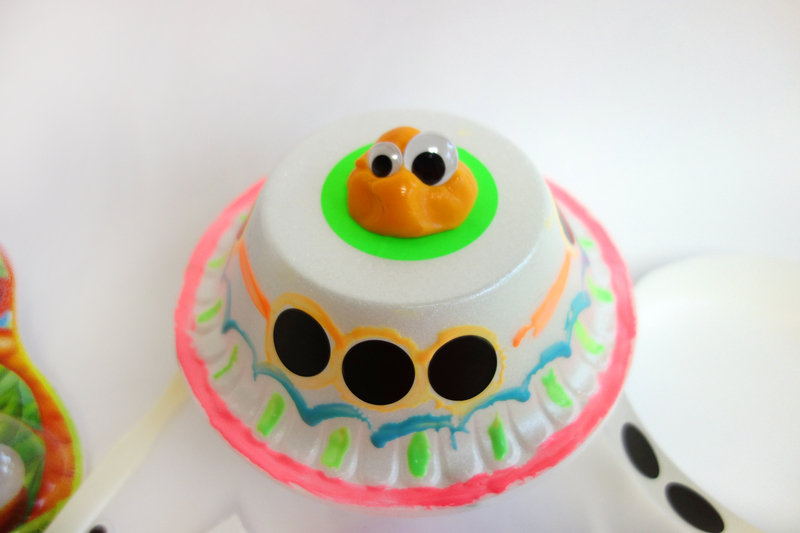 To start our adventure into space, we needed to make Zork and His Space Cruiser. 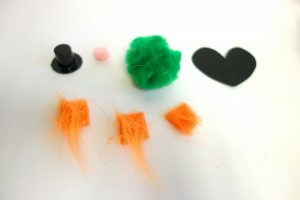 Above are all of the materials needed to make the fearless Zork and his sturdy space cruiser. 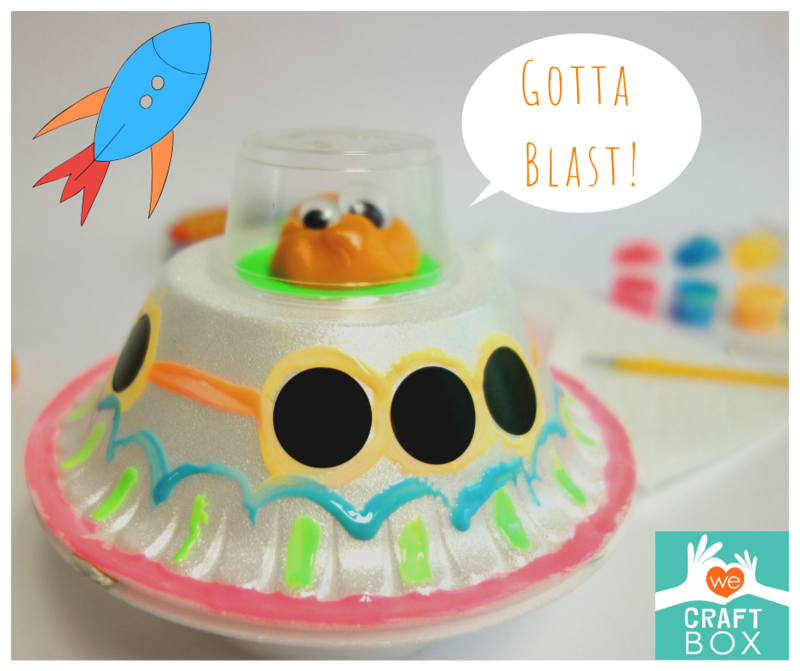 First, we started out with the space cruiser. 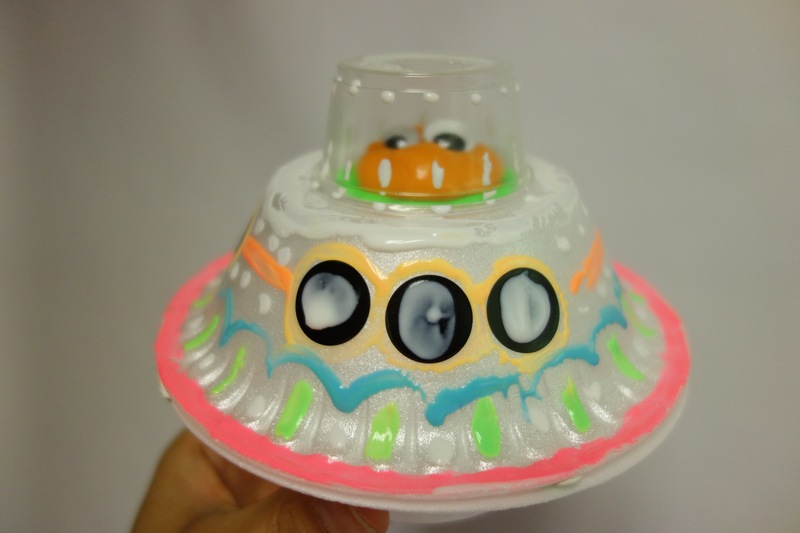 The little black stickers made great windows for the space cruiser. 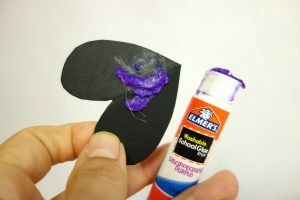 The big green sticker was for Zork’s cockpit! 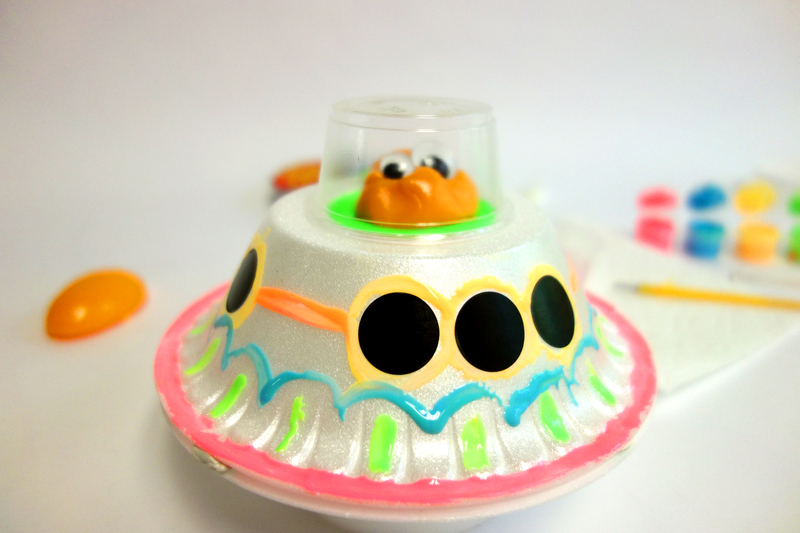 Now that the space cruiser had been assembled, we needed to make Zork so he could begin his journey to space! 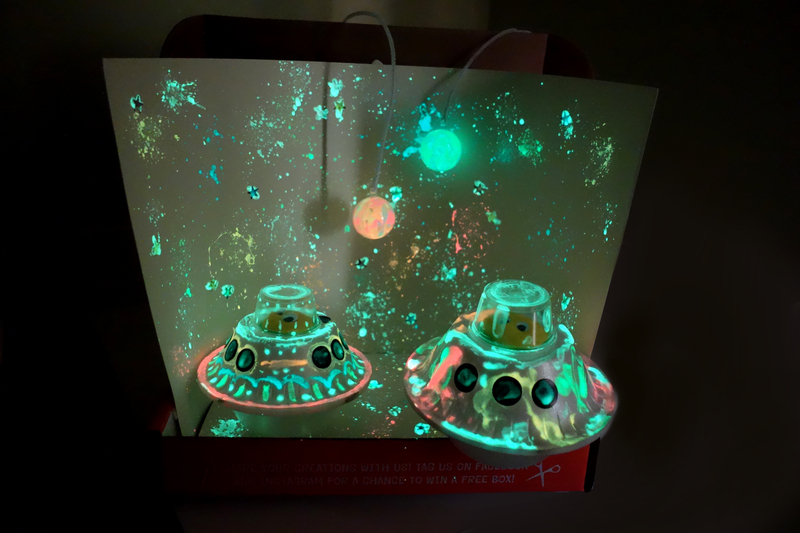 Once Zork and his cruiser had been made, the kiddos had to decorate the cruiser with glow paint so it could be seen in outer space! 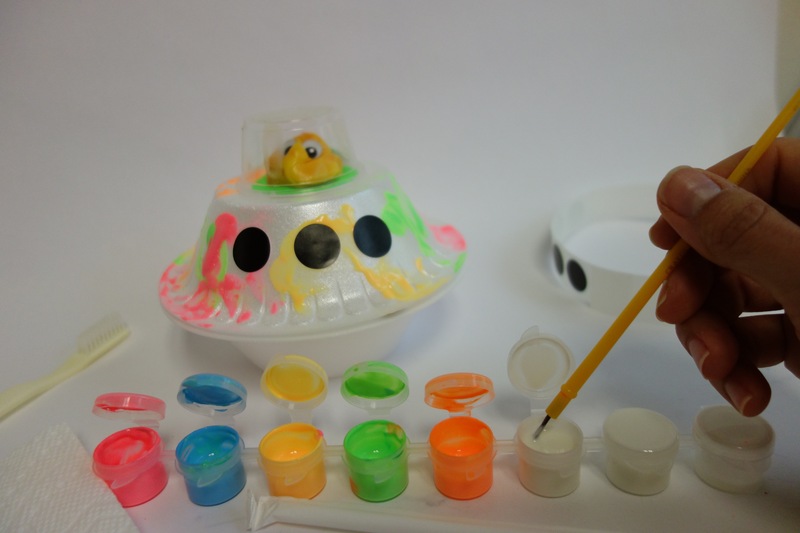 Zork’s space cruiser certainly glowed bright after adding the paint! 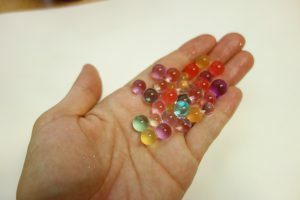 We had one little problem before we could embark on our journey to space. 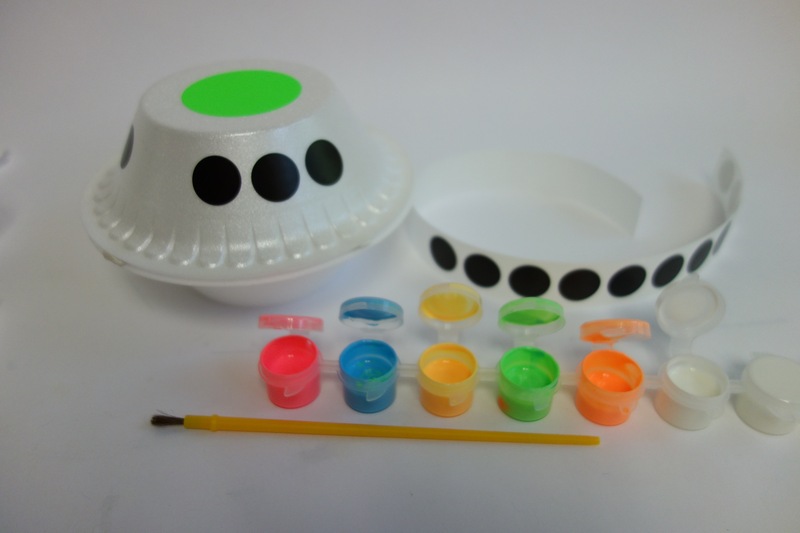 We had to make Outer Space first! 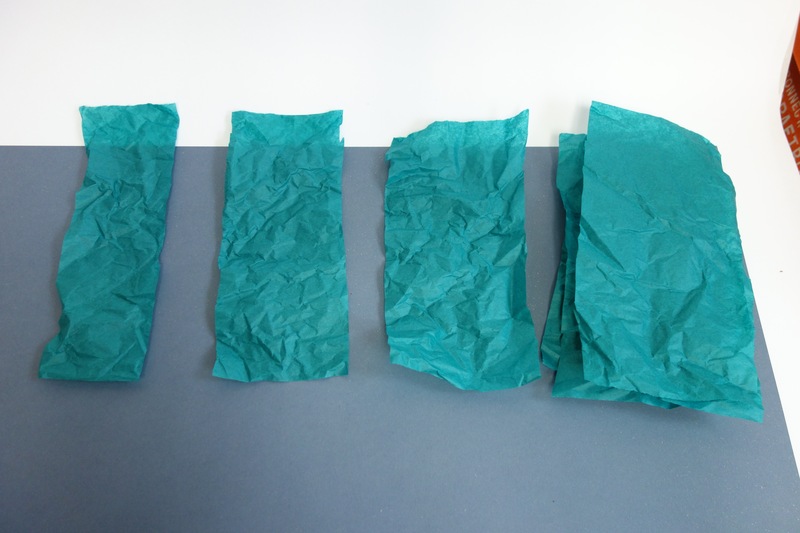 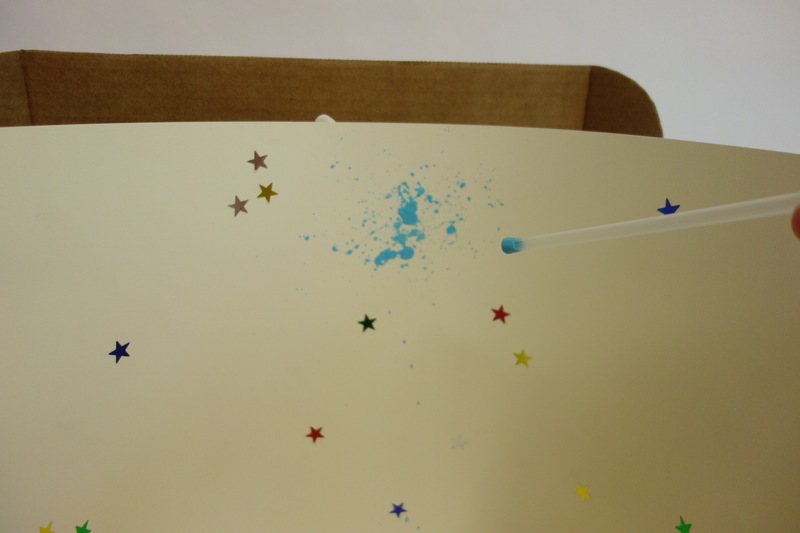 We put a flat sheet of white paper up against the back of the propped up We Craft Box as our outer space backdrop. 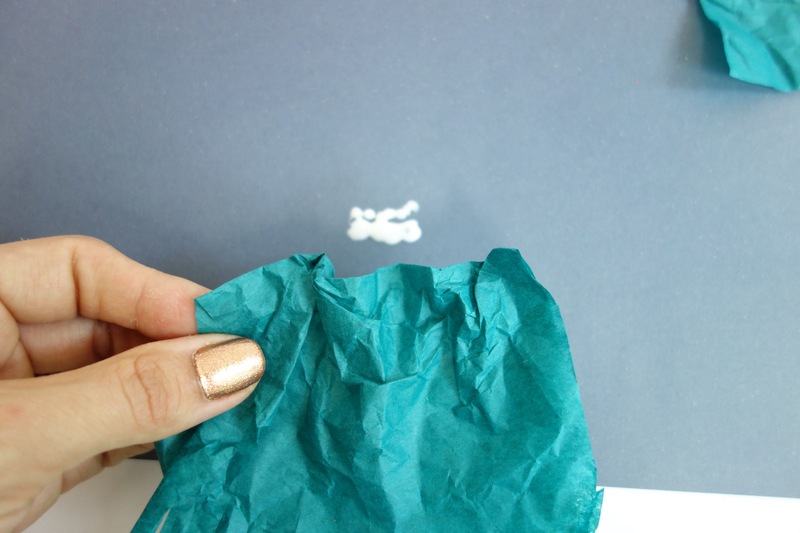 We were able to hold this flat sheet of paper up with poster tac. 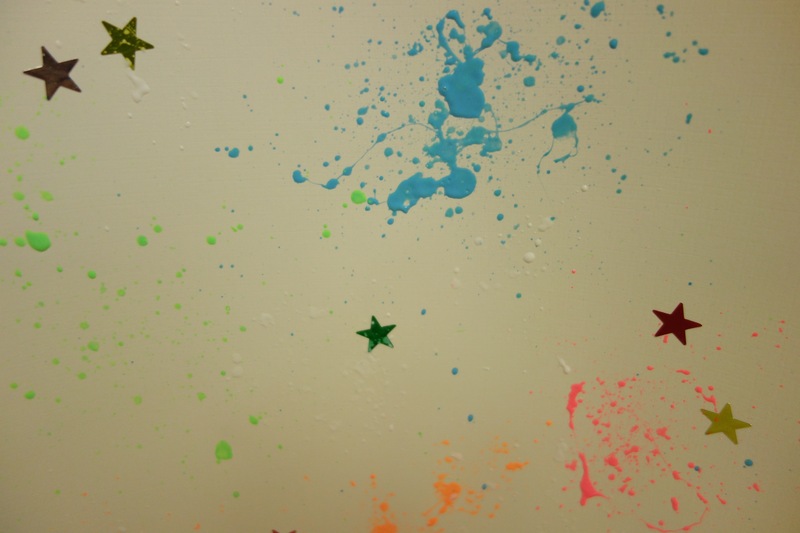 We also added some star stickers and glow paint splatters to our star scape. 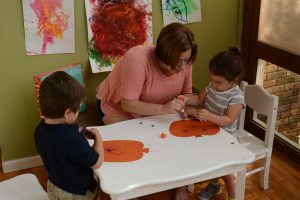 Making the splatters was super fun and interactive for the kiddos! 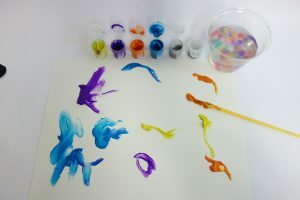 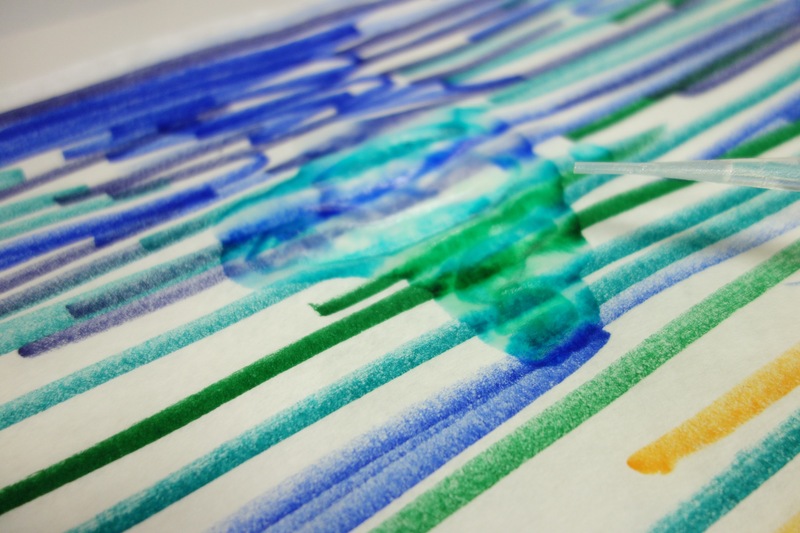 With some glow paint, straws, and toothbrushes, these splatters were easy to make. 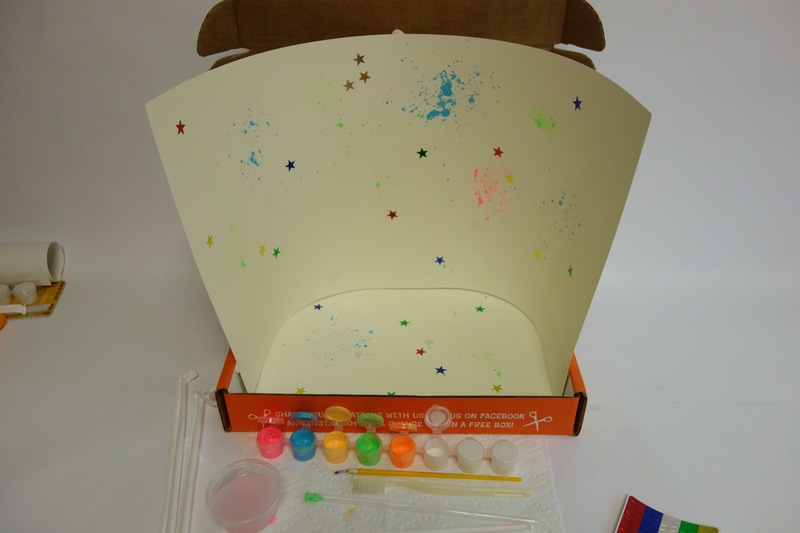 To complete our outer space scene, we needed to make some planets. 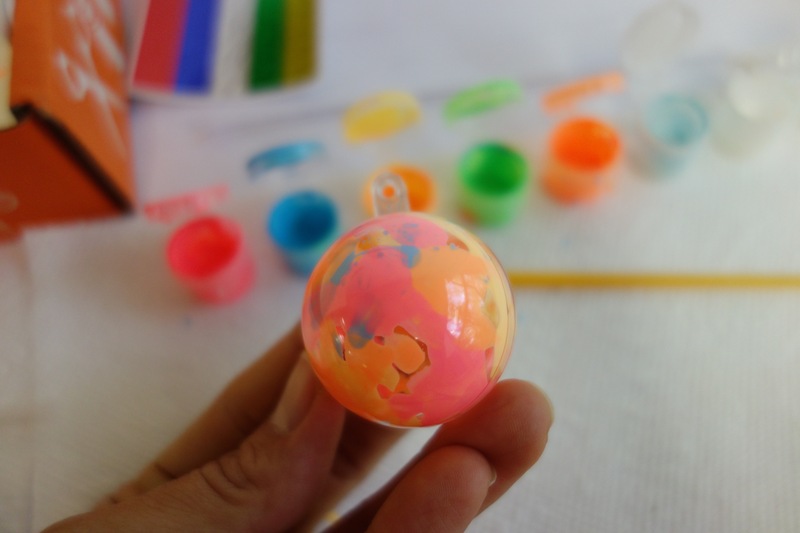 We painted the inside of some transparent ornaments and hung them to back of the We Craft Box with a pipe-cleaner. 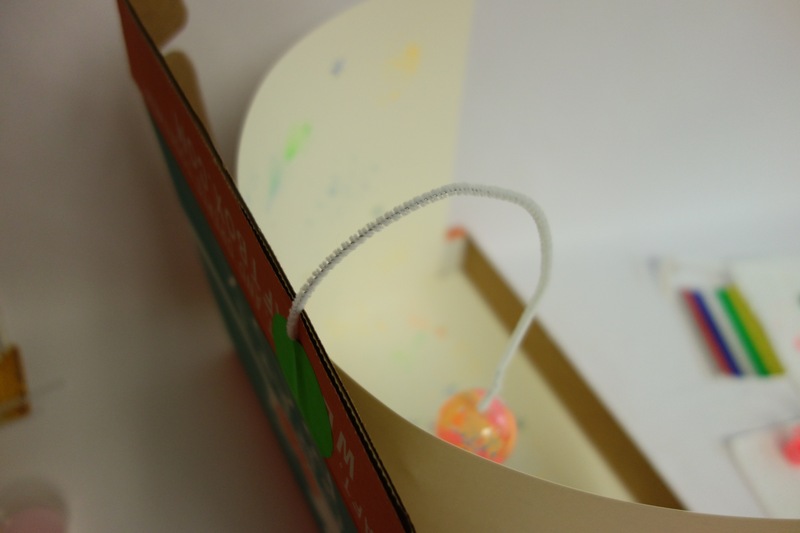 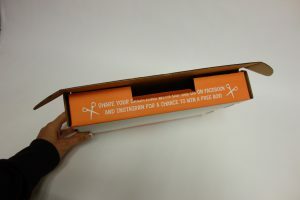 We used some stickers to hold the pipe-cleaners to the back of the box. 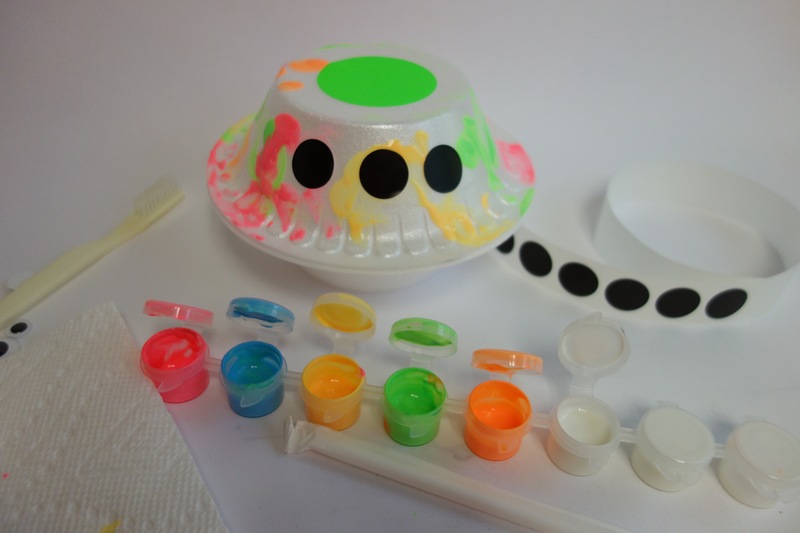 We also added a lot of white glow paint to the planets so Zork would be able to see them easily when he was flying his cruiser. 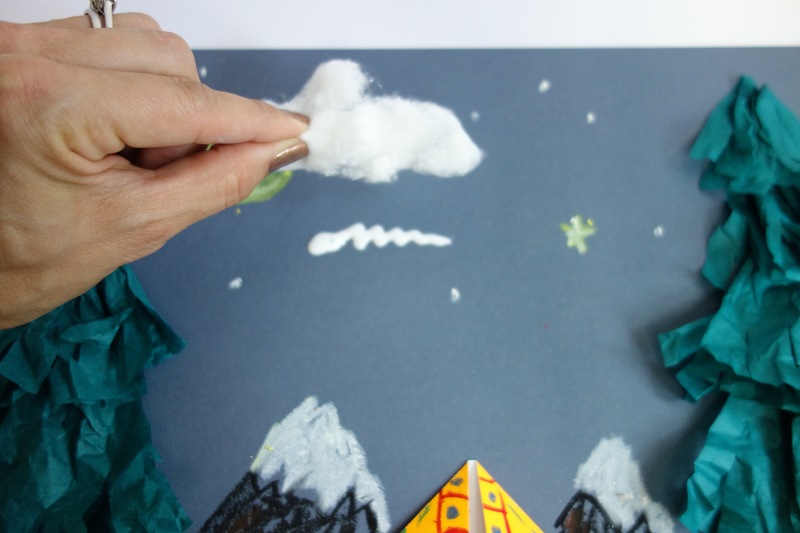 After a fun and creative journey, Zork was able to make it to outer space! 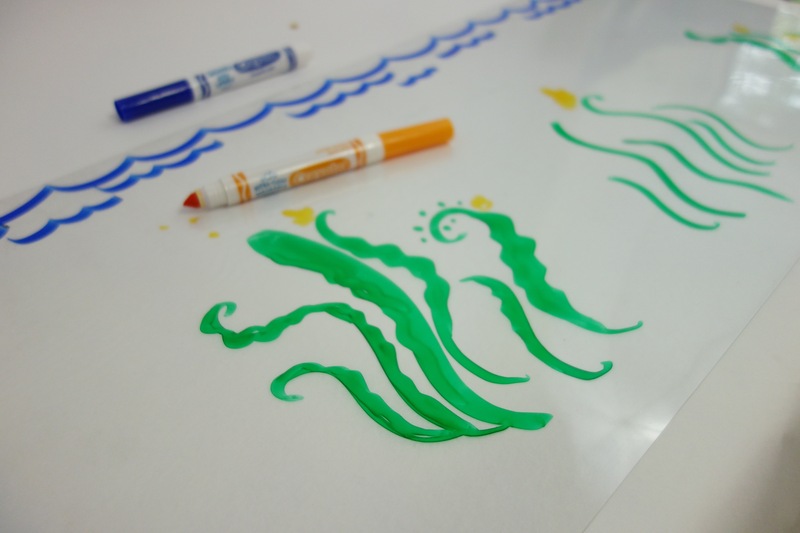 Thanks for coming on an awesome outer space adventure with Zork! 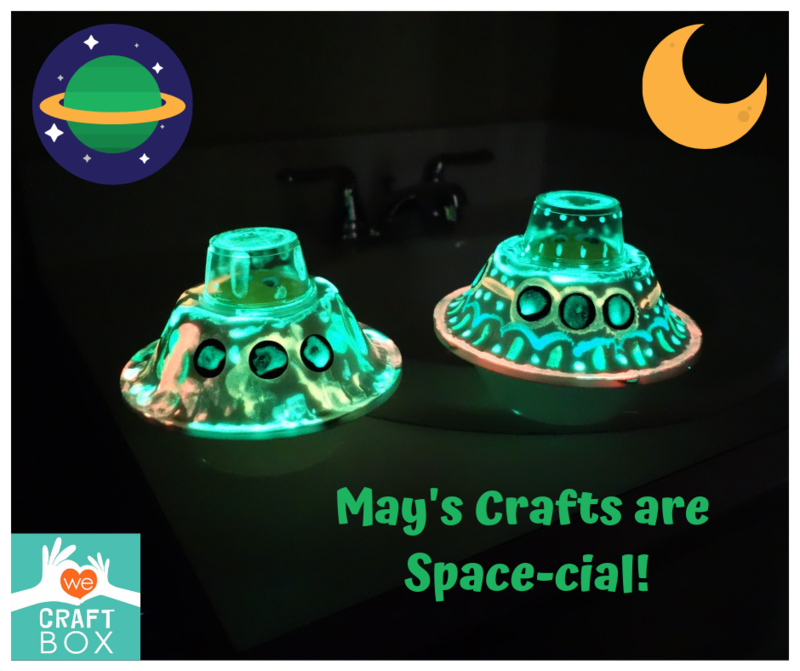 Author Meg FisterPosted on January 20, 2019 January 26, 2019 Categories Past BoxesLeave a comment on May’s Crafts Are Out of This World! 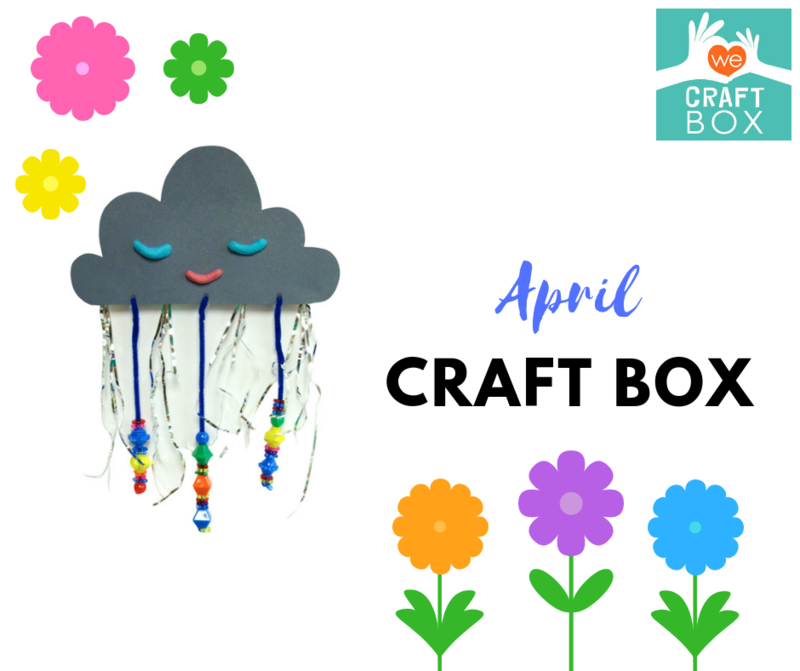 April Shower’s Bring a New Craft Box! 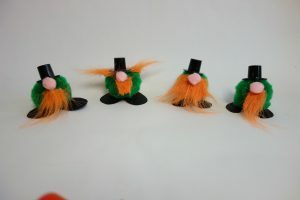 It’s that month where it just does not seem to stop raining and the grass grows two times faster than it normally does! 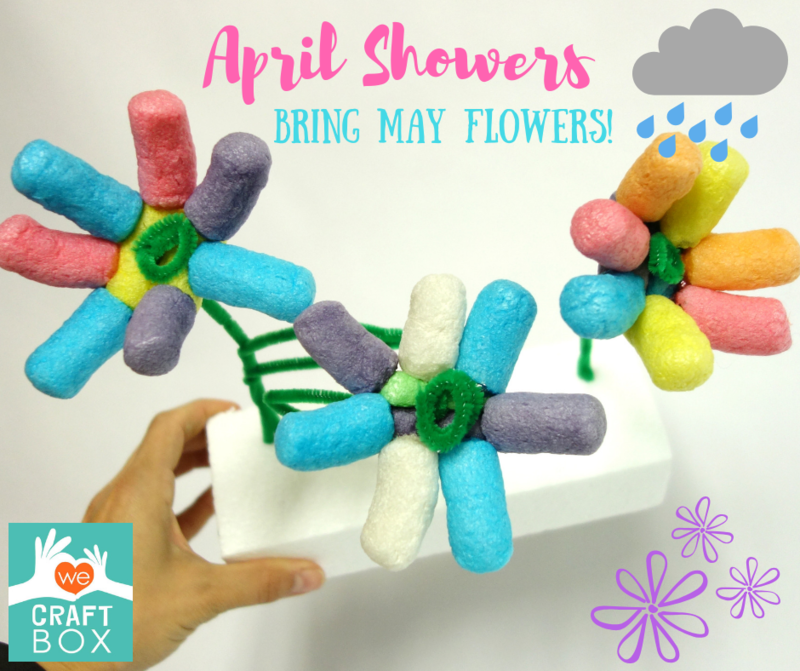 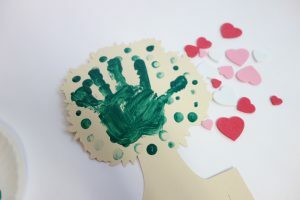 With rain comes spending more time inside, so here are a couple of crafts that were a part of the April box that we spent our time doing! 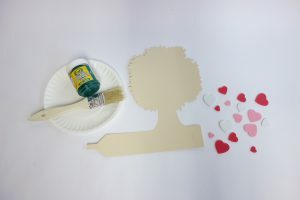 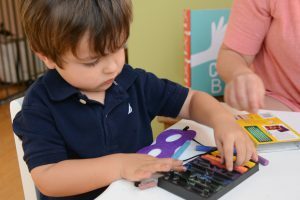 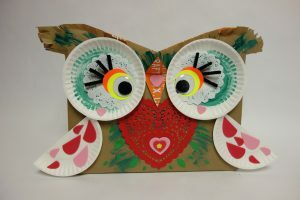 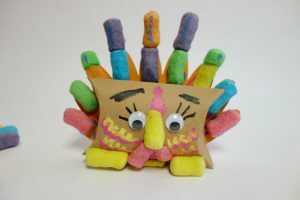 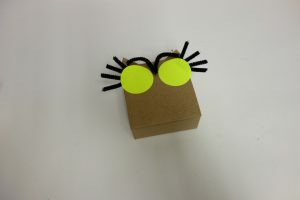 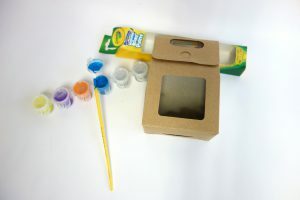 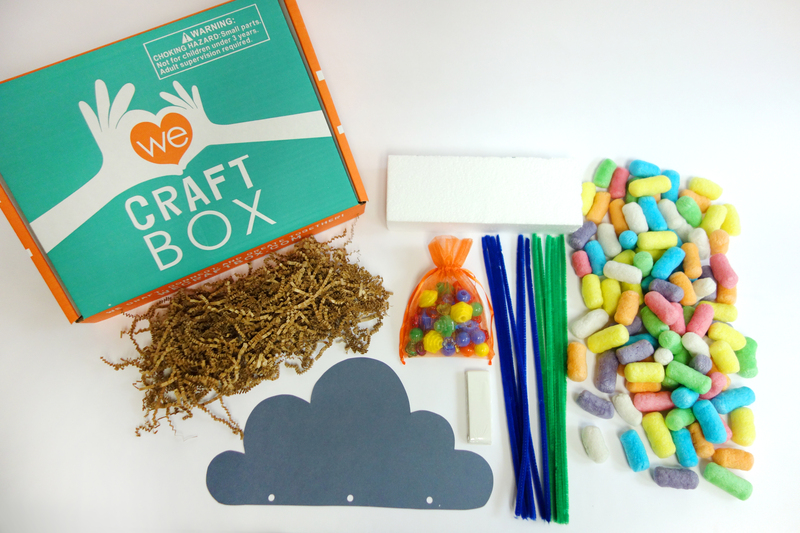 All of the materials needed to make these fun crafts on a gloomy day were provided in April’s We Craft Box. 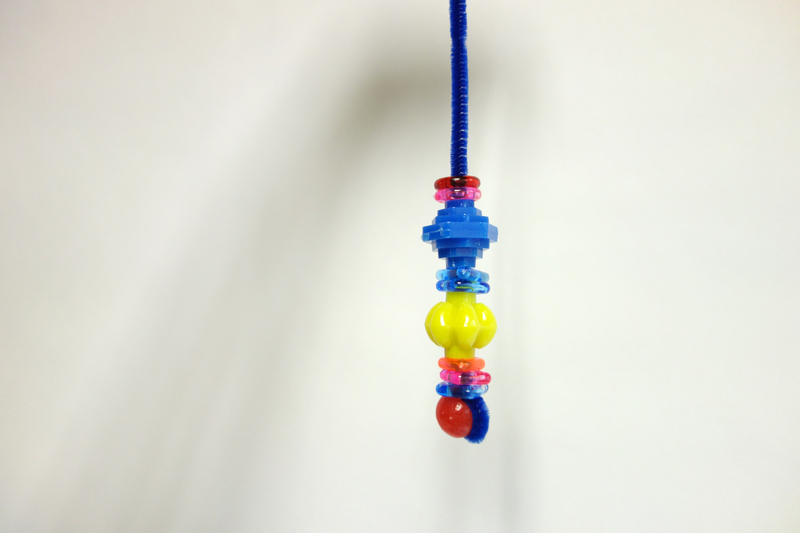 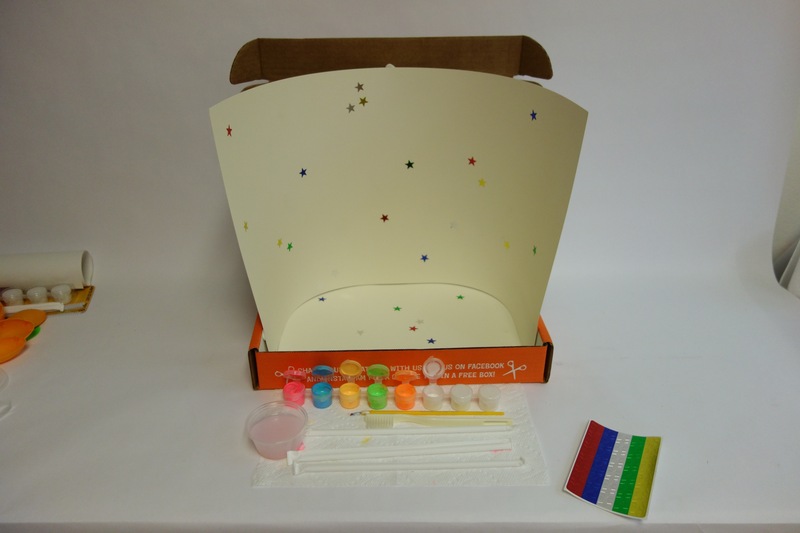 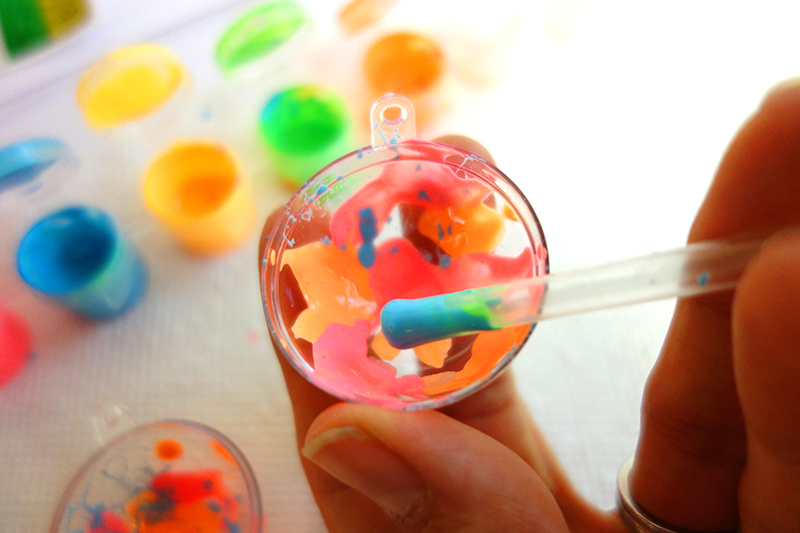 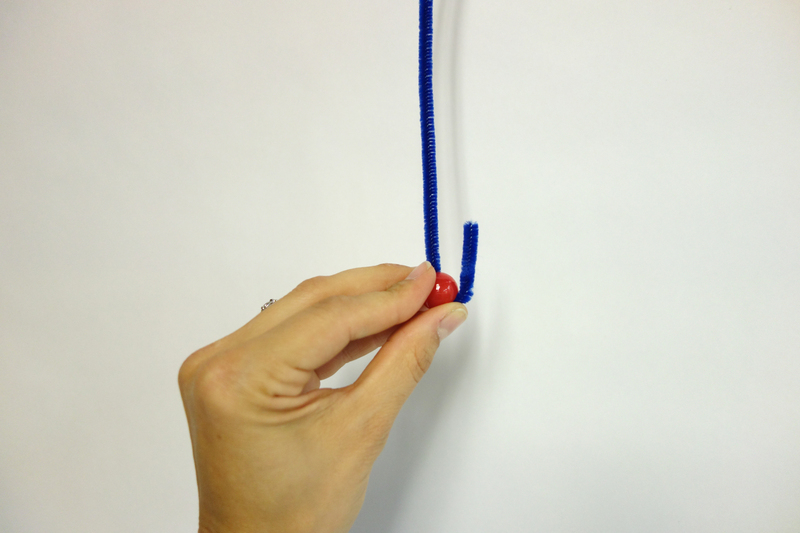 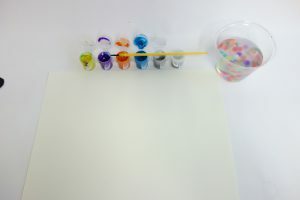 The special art material for the April Box were the Magic Nuudles and beads! 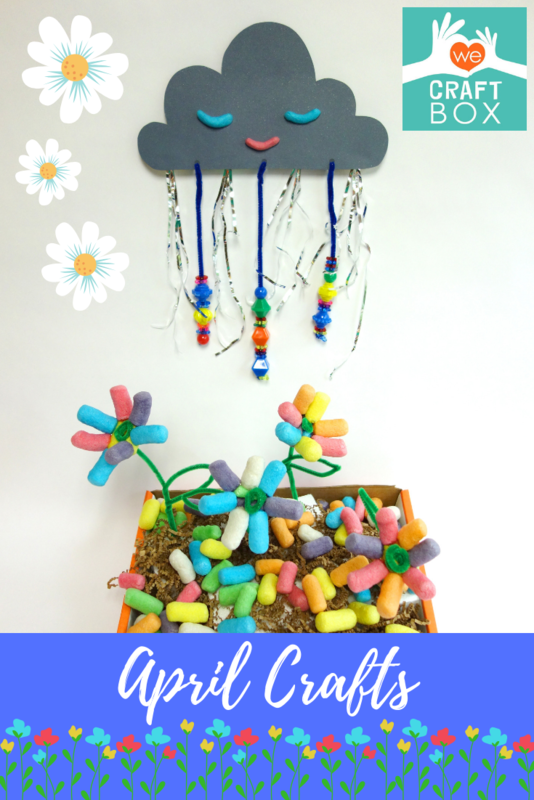 In our first craft, we made some rainbow daisies to brighten up the room. 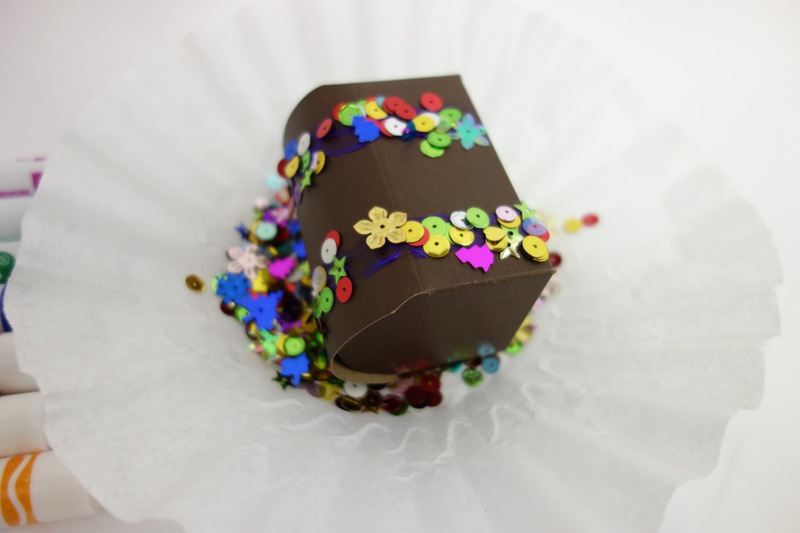 In this craft, we used the Magic Nuudles as petals for the daisies. 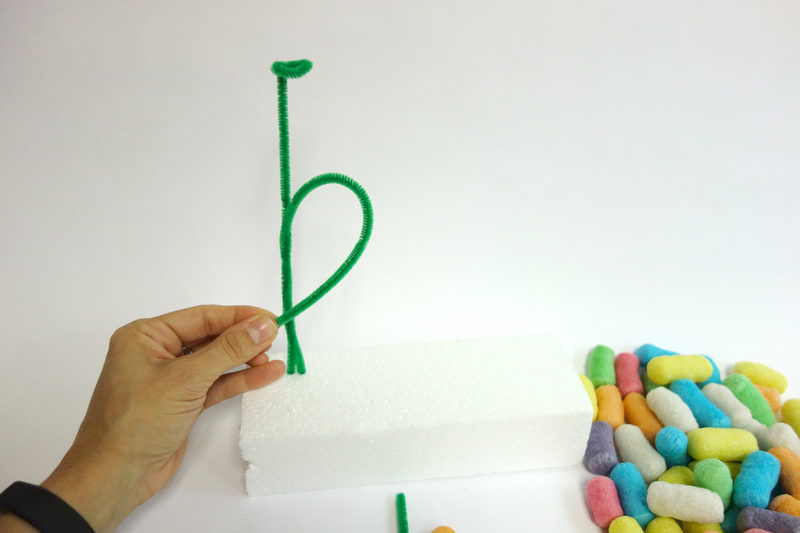 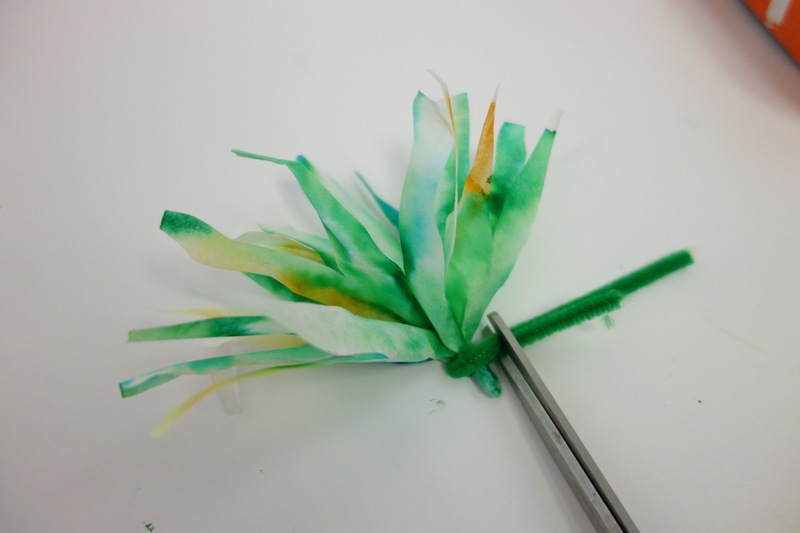 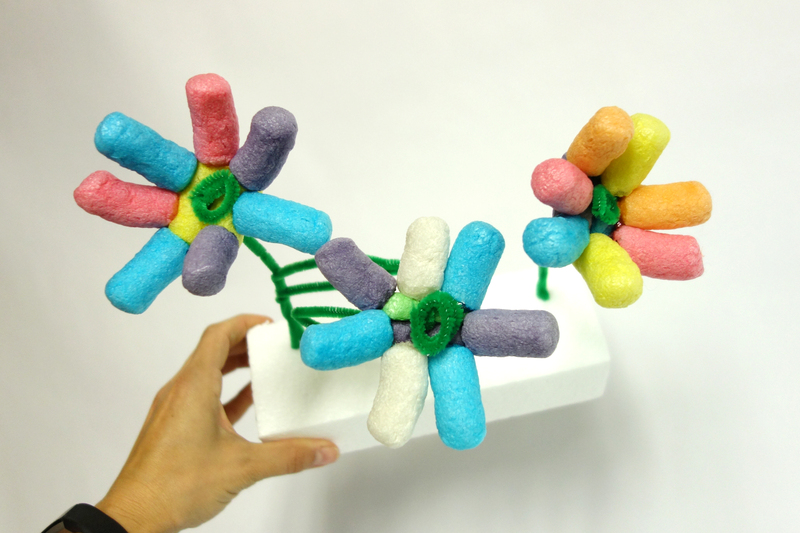 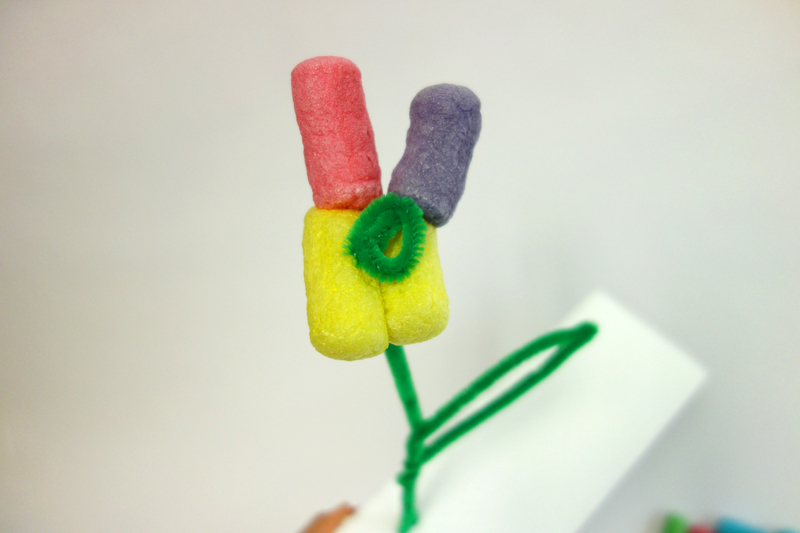 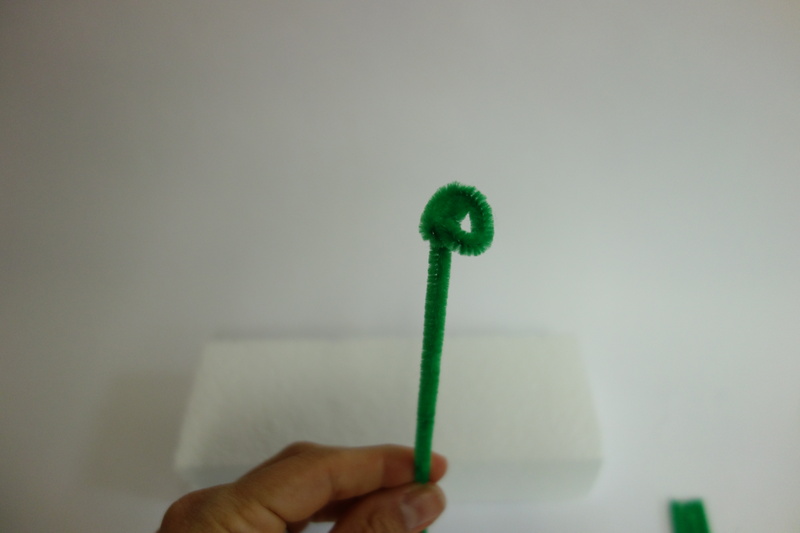 The green pipe cleaners also made awesome stems! 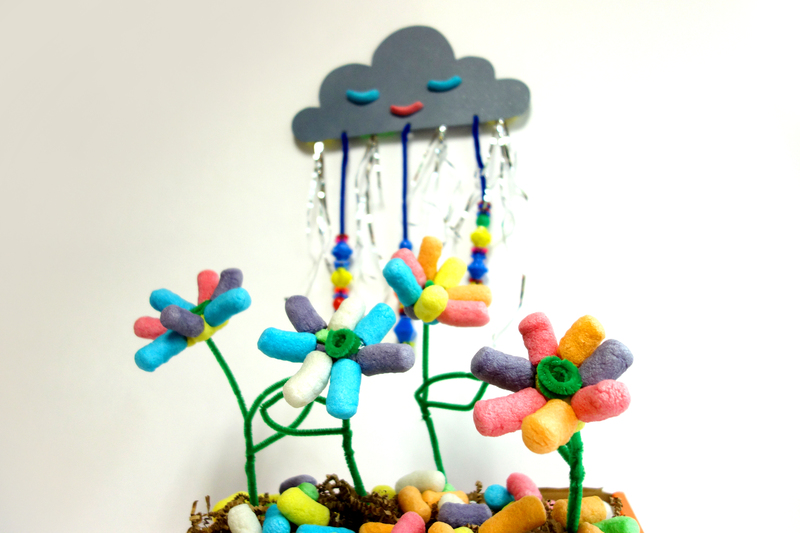 Those are the cutest rainbow daisies I think I have ever seen! 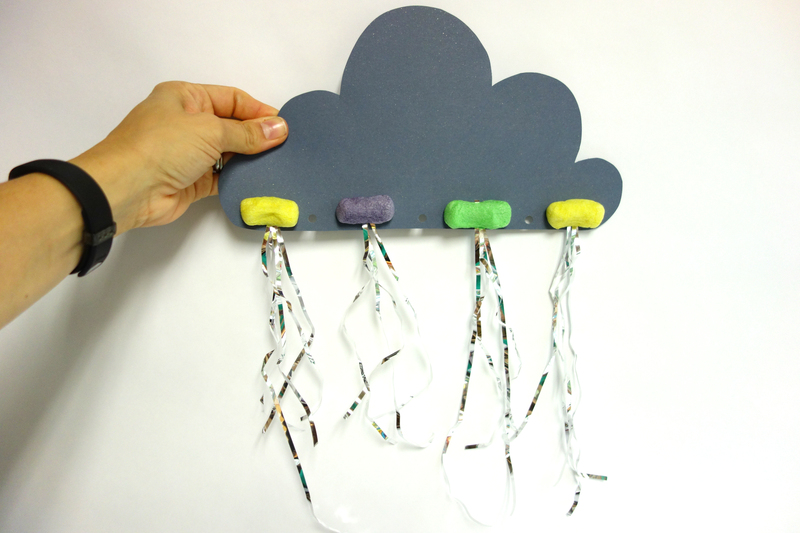 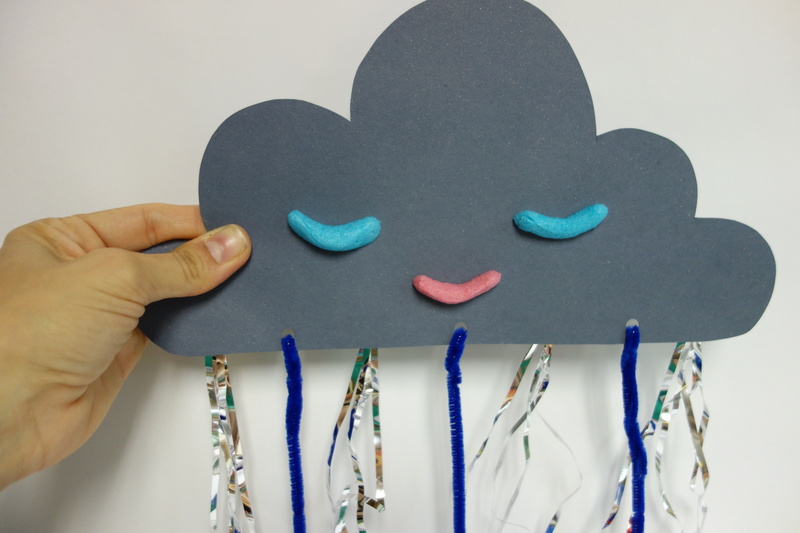 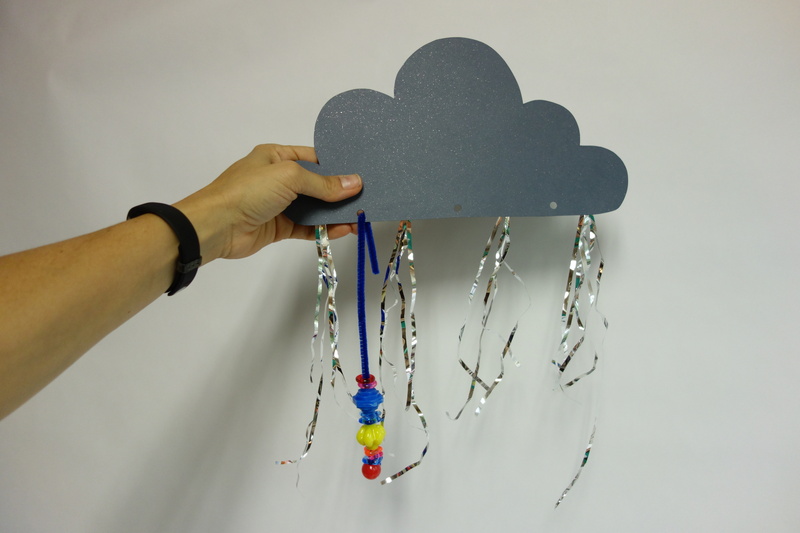 Every flower needs a little water to stay nourished, so that is why our next craft is making the Happy Raincloud. 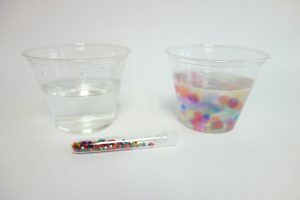 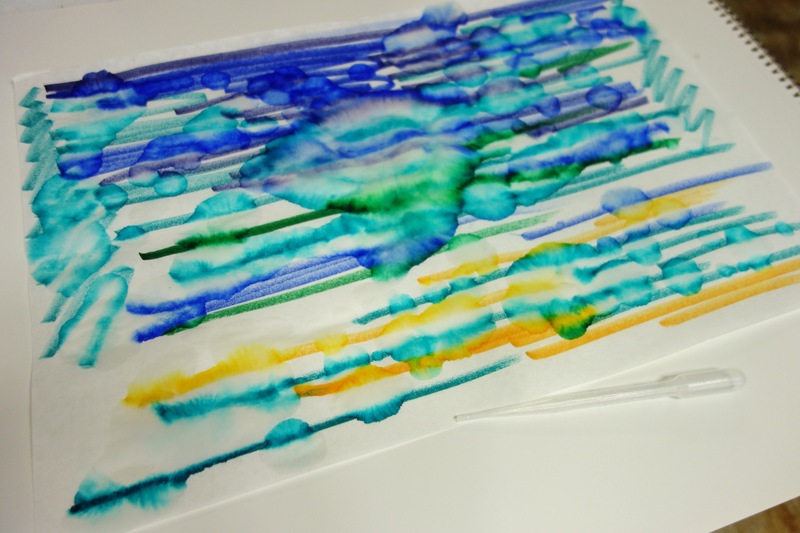 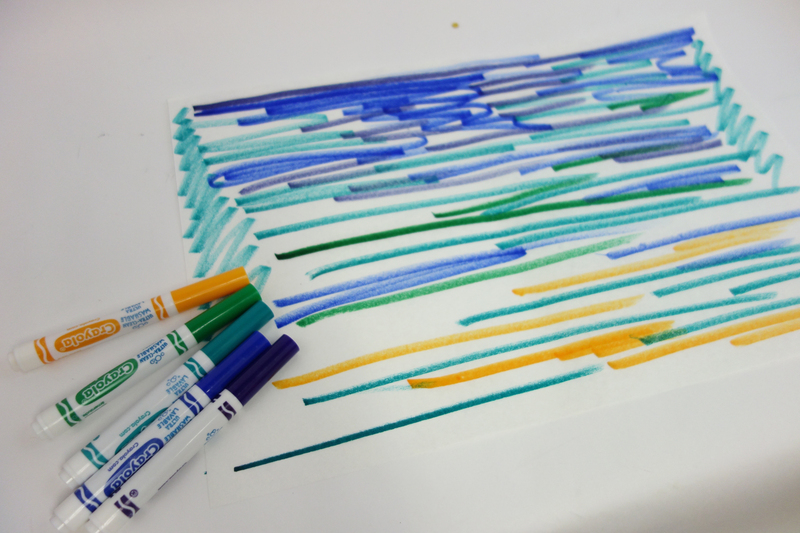 In this craft, we used the beads to look like streaks of rain! 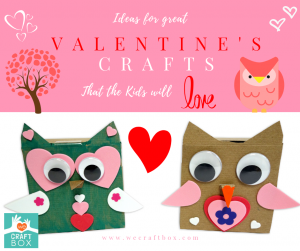 It was a cute and creative touch to this craft. 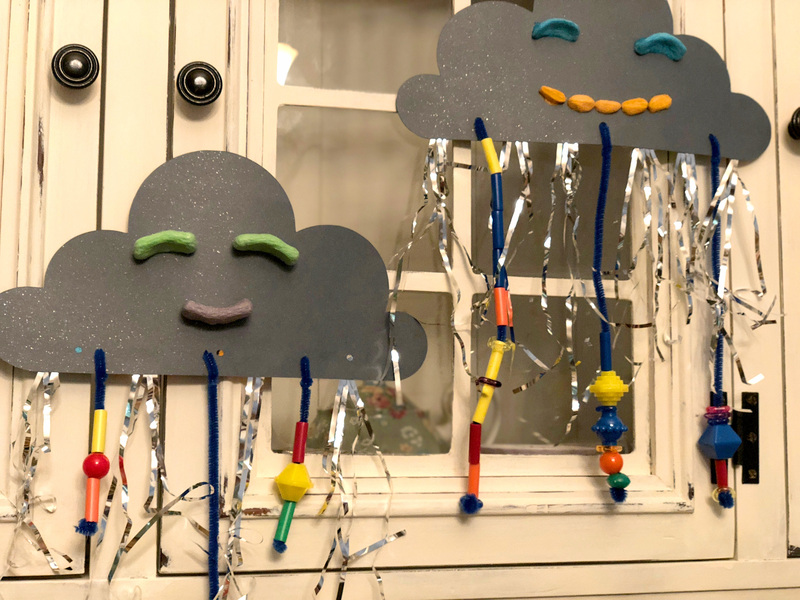 Typically rainclouds make me feel gloomy, but I can’t help but smile when looking at this one! 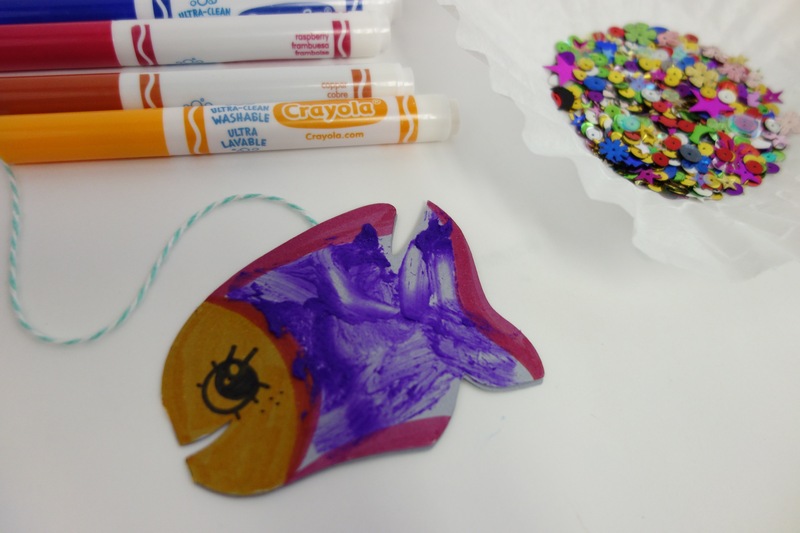 The best part of all is that the kids had a blast making these crafts! 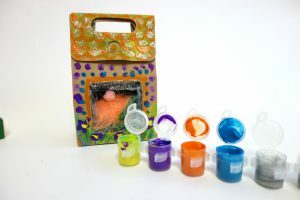 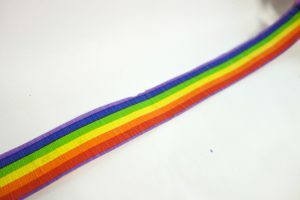 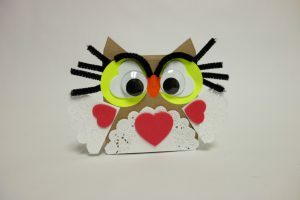 If you are interested in doing more crafts like these, visit our website at www.wecraftbox.com. 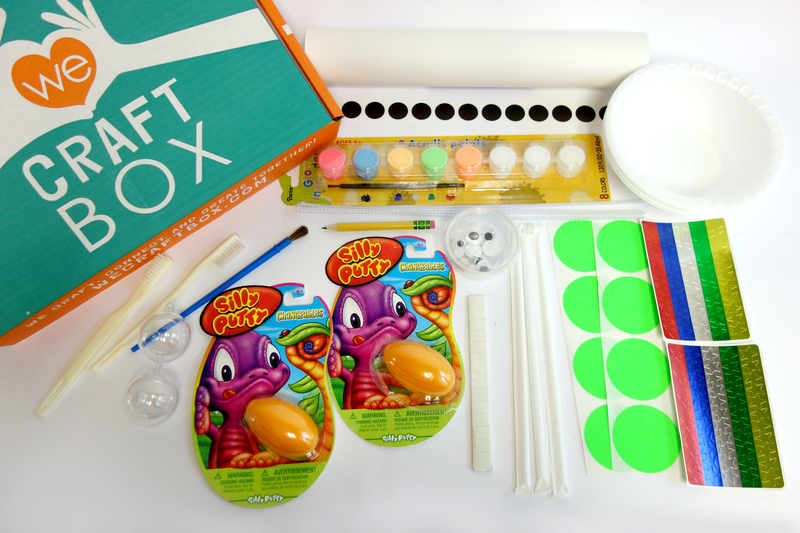 To see an unboxing video of April’s box, click the video down below! 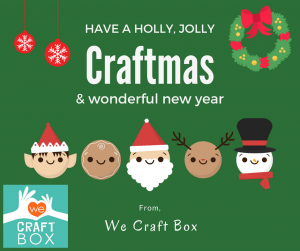 Author Meg FisterPosted on September 22, 2018 Categories Past BoxesLeave a comment on April Shower’s Bring a New Craft Box! 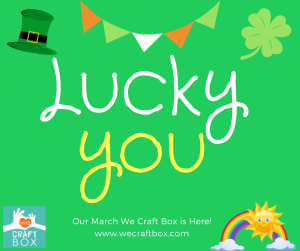 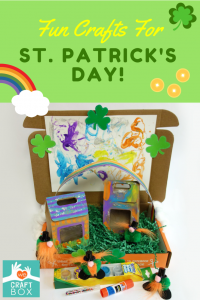 Author Meg FisterPosted on September 7, 2018 Categories Past BoxesLeave a comment on St. Patrick’s Day Brought Us Luck and a New We Craft Box! 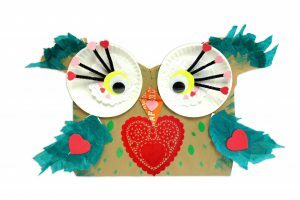 Author Meg FisterPosted on September 4, 2018 Categories Past BoxesLeave a comment on Owl You Need is Love! 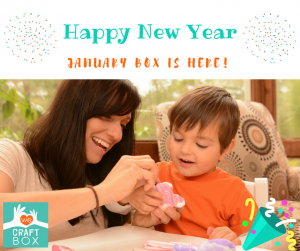 New Year means a New Craft Box! 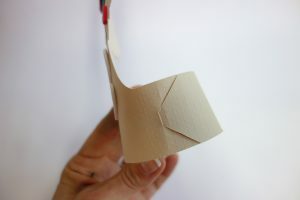 And just like that, it is 2018. 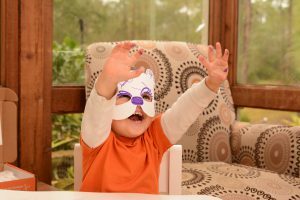 Time sure does fly by when you’re having fun! 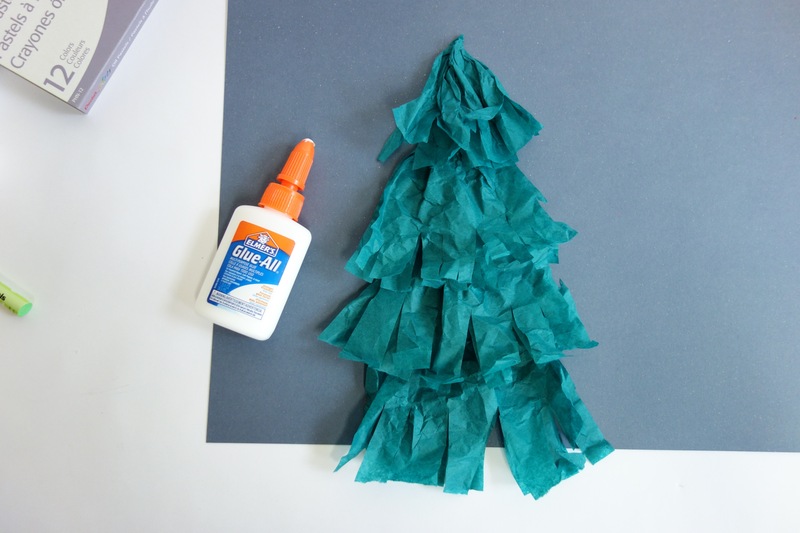 And what’s not fun about starting the year off with some crafts? 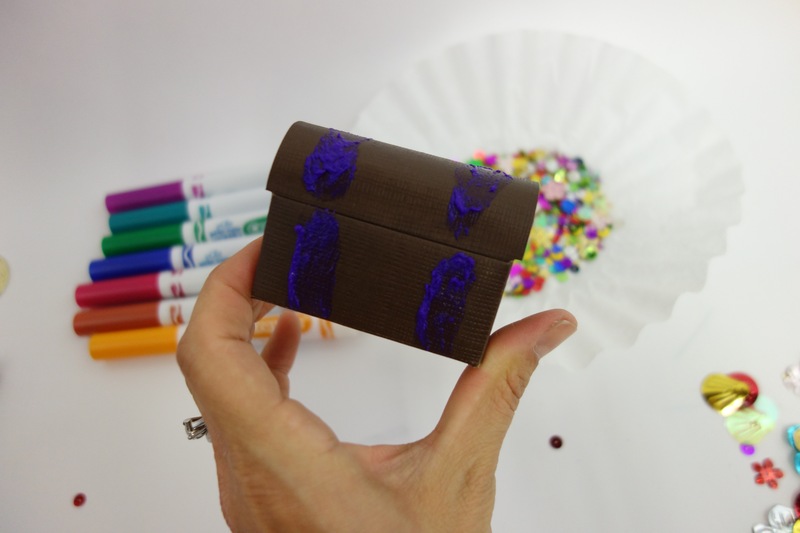 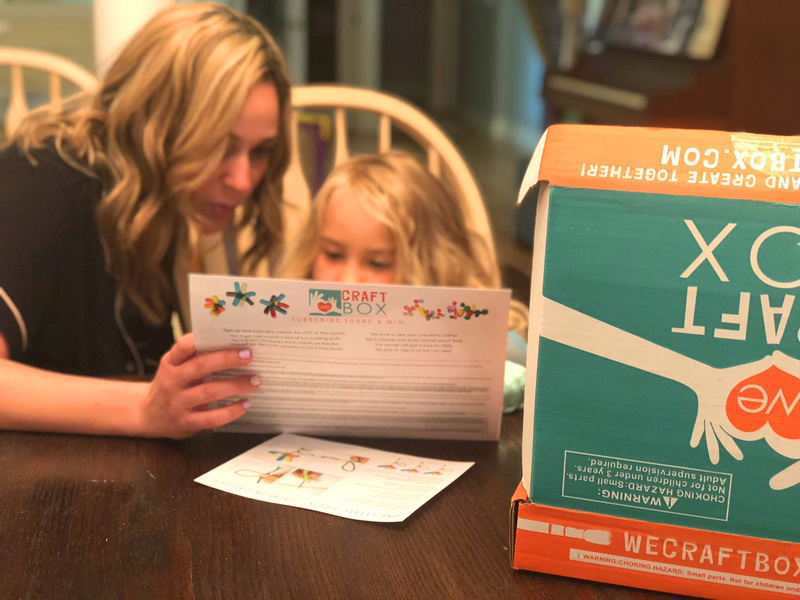 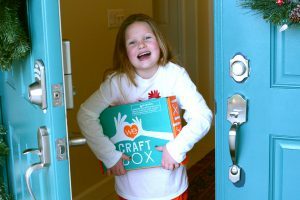 I know it can be hard sometimes to find fun things for the kids to do while they are off of school, but We Craft Box can always help with that! 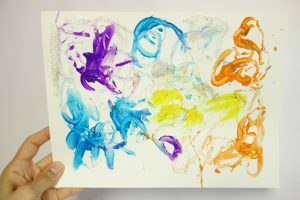 To start our adventure off with the fun we had with the January 2018 Box, we must mention our very special art material we used this month! 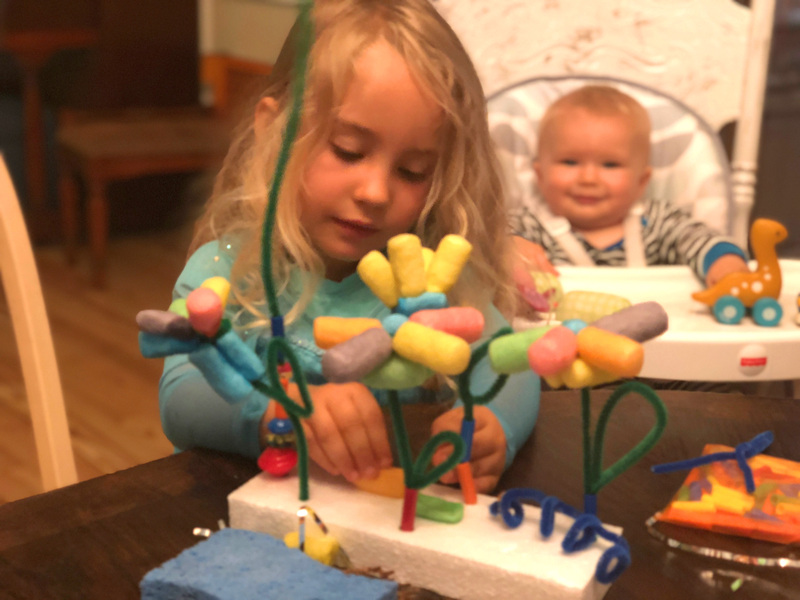 This month, the kids were able to mess around with some Model Magic! 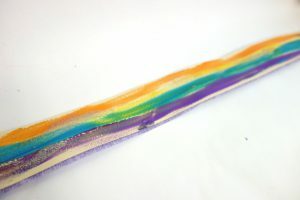 This was a super exciting part of this month’s box because I believe the kids really loved working with this material. 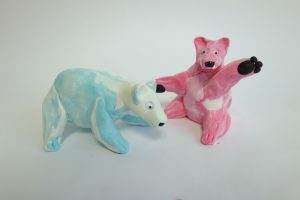 With the Model Magic, we made the Shining Polar Bears of the North! 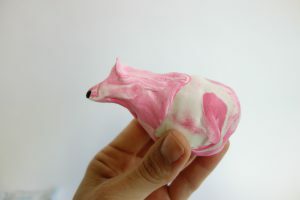 Since the Polar Bears live so far away in the North Pole, we just had to make our own! 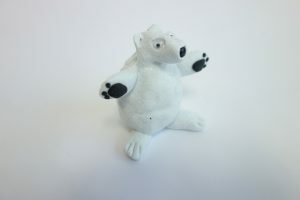 I’ve never seen a more precious polar bear in my life! 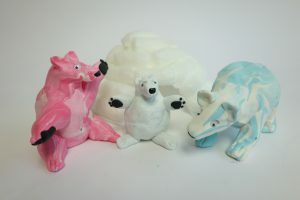 We made a few different polar bears, all different shapes and colors. 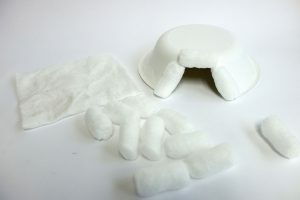 Considering these sparkling polar bears live in the North Pole, we thought they might enjoy a cozy igloo to live in. 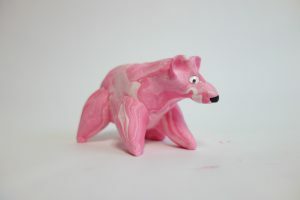 And just like that, the polar bears had a home of their own! 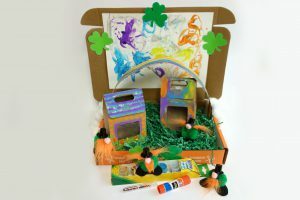 With their igloo, they were all able to snuggle up as one big and happy family. 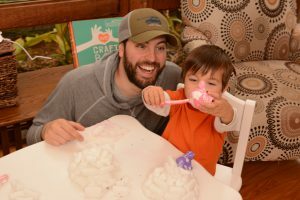 Just like the polar bears were able to spend time as a family in their new igloo, we were also able to spend time as a family making the igloo and polar bears! 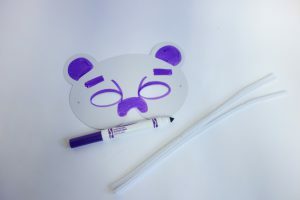 We also didn’t want to miss out on the polar bear party, so we made our own polar bear masks to match with them! 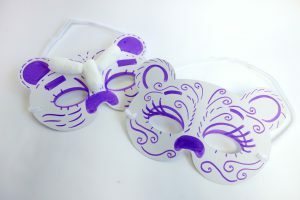 The kids were able to get really creative with these masks and could even imagine themselves as being a polar bear! 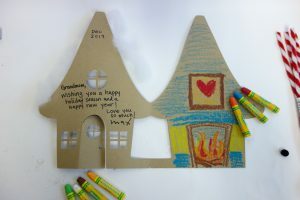 I love starting out the new year making memories with my family and you can too! 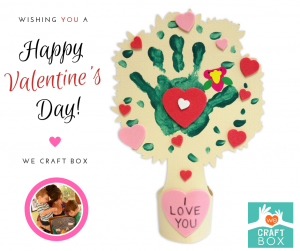 But we would love to be a part of those memories and help provide you with the materials you need to craft some cute keepsakes! 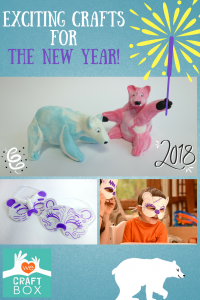 I hope that everyone had a great 2017 and that 2018 brings only more happiness. 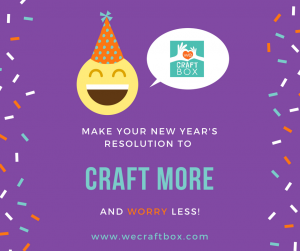 Author Meg FisterPosted on September 2, 2018 Categories Past BoxesLeave a comment on New Year means a New Craft Box! 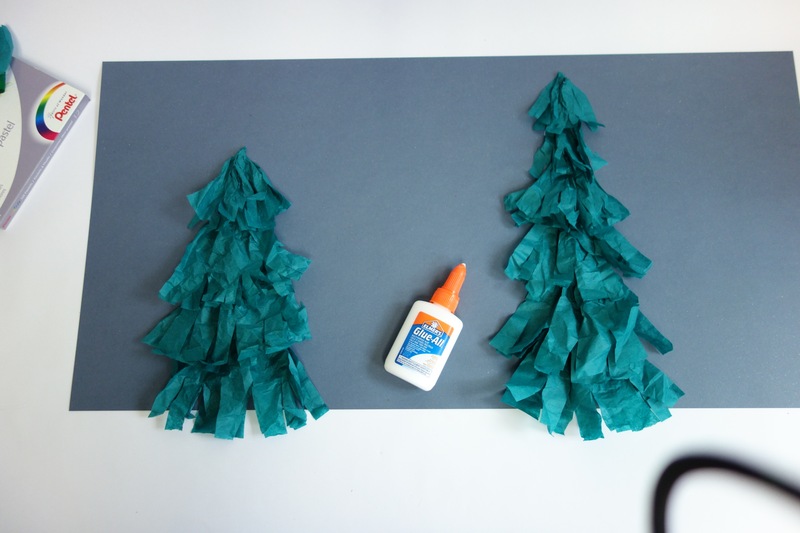 Winter is approaching and that means spending more time inside away from the cold! 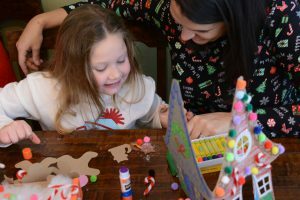 To keep the kiddos occupied, our December 2017 Box offered some fun crafts and the kids were able to make their own Gingerland Village. 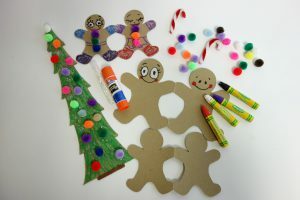 We also found that these crafts were great to put on display for all the family to see when they come to visit this Holiday season! 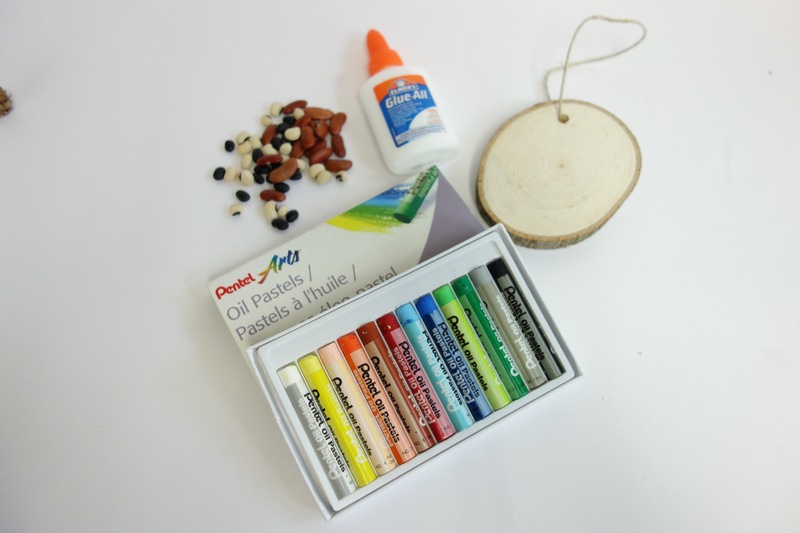 In our December 2017 Box, the special art material we used were oil pastels. 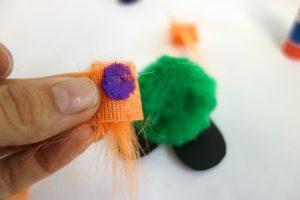 We also used some other fun materials such as colorful pom poms! 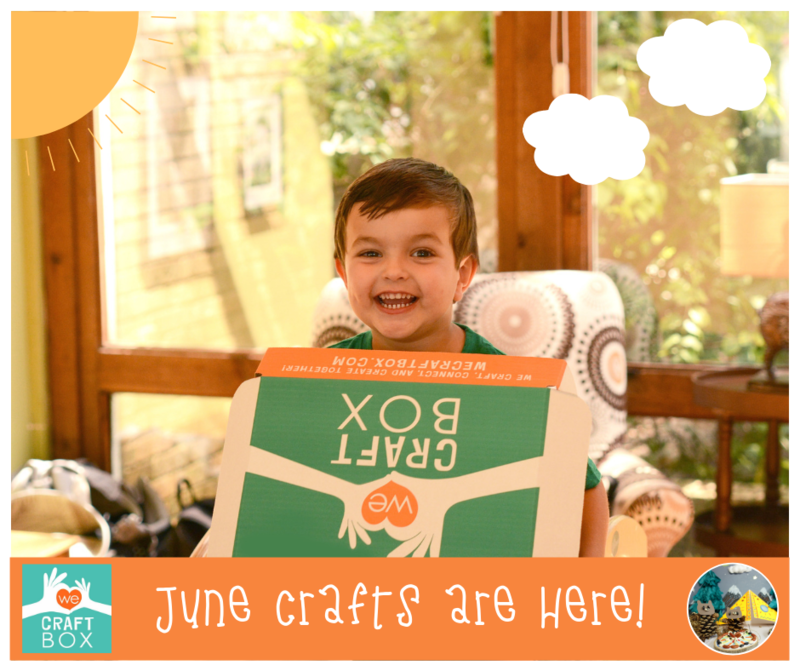 As you can see, some people were all smiles when they got to open this month’s craft box. 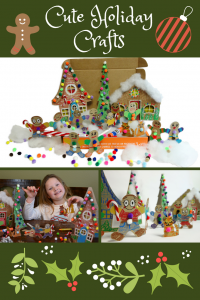 The first things the kids had to do for their Gingerland Village was to make their Gingerbread Friends! 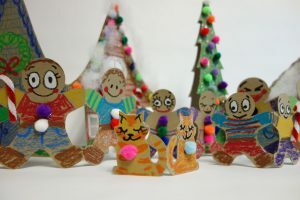 The kids also made sure the Gingerbread Friends would not get lonely, and made pet kittens for them! 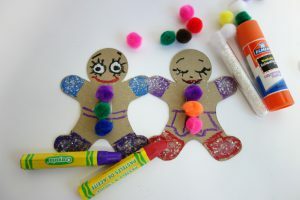 They were able to add oil pastels, pom poms, and glitter to make their Gingerbread Friends shine. 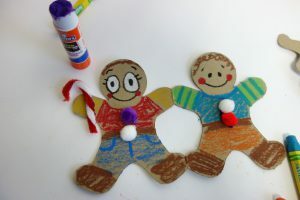 If you wanted to make your Gingerbread Friends extra sweet, you had the option to add candy canes to their hands! 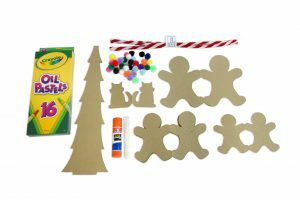 We couldn’t forget the Gingerbread Friend’s own Christmas tree either! 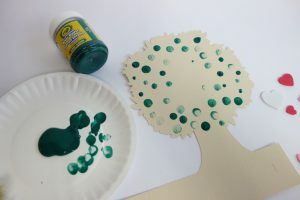 By adding pom poms, the tree turned out super cute and colorful. 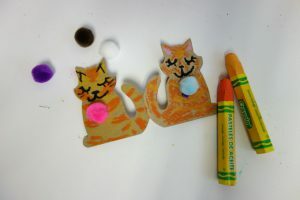 And last, but certainly not least, the kittens turned out purrfect! 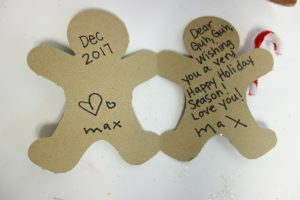 I think my favorite part of the Gingerbread Friends is that you had the choice to write a short holiday greeting to the person of your choice! 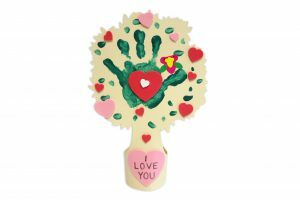 We definitely thought it was a cute and simple way to let your loved ones know that you were thinking of them during the holidays. 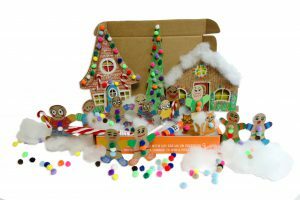 The next part to get the Gingerland Village up and running is to make the houses that the Gingerbread Friends will live in. 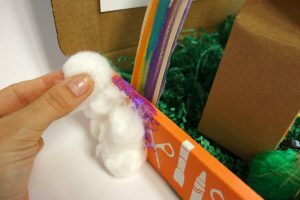 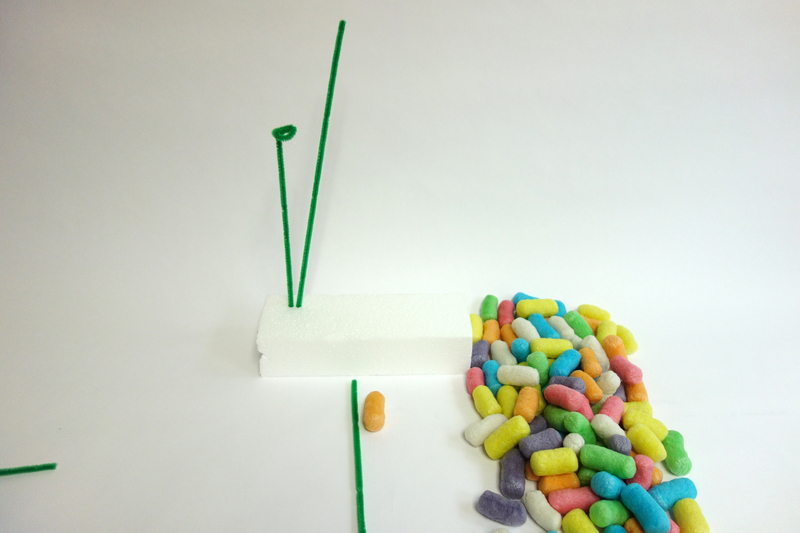 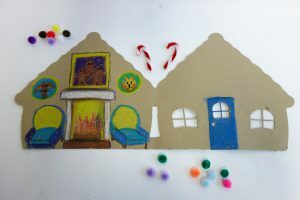 This part of the craft let the kid’s imagination flow as they were able to decorate their houses with a lot of different materials such as the oil pastels, colorful pom poms, and white cotton balls to make it look like snow perched on the roof! 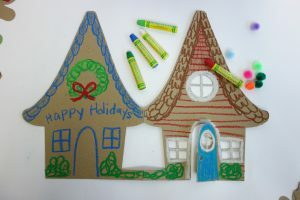 Holiday messages can also be written in the Gingerbread Friend’s houses! 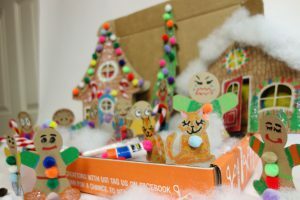 The last part of this was where the magic happened, which was when we put the Gingerbread Friends in Gingerland Village! 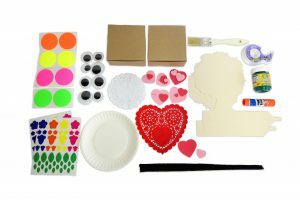 Assembling these items together turns out great and adds cheer and joy to the house! 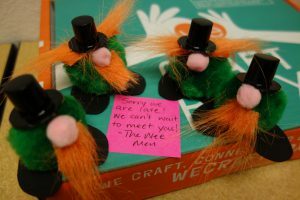 Who knows, maybe Elf on the Shelf will pay Gingerland a visit. 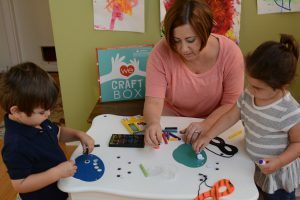 The last thing that was great about this craft is that it gives the family a chance to sit down and spend time together. 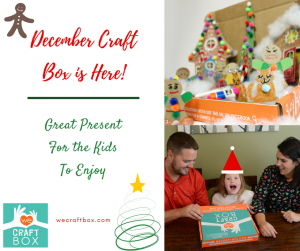 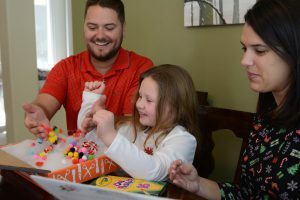 That is a big inspiration behind this box and nothing beats spending time with the family, making crafts, and listening to some holiday music! 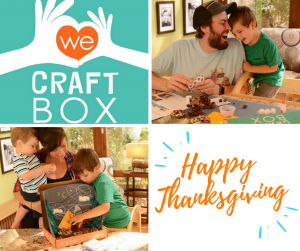 We’d Like a Moment to Gobble about our November 2017 Box! 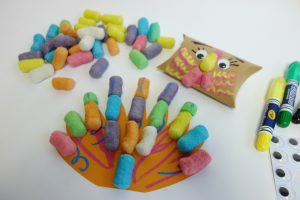 Thanksgiving is right around the corner and I wanted to share some crafts that your whole family is sure to gobble up! 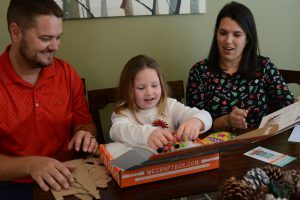 I am so thankful for my family and the memories I get to make with them. 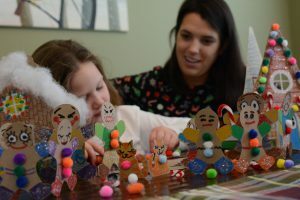 I am also thankful that I get to share crafts like these with your families! 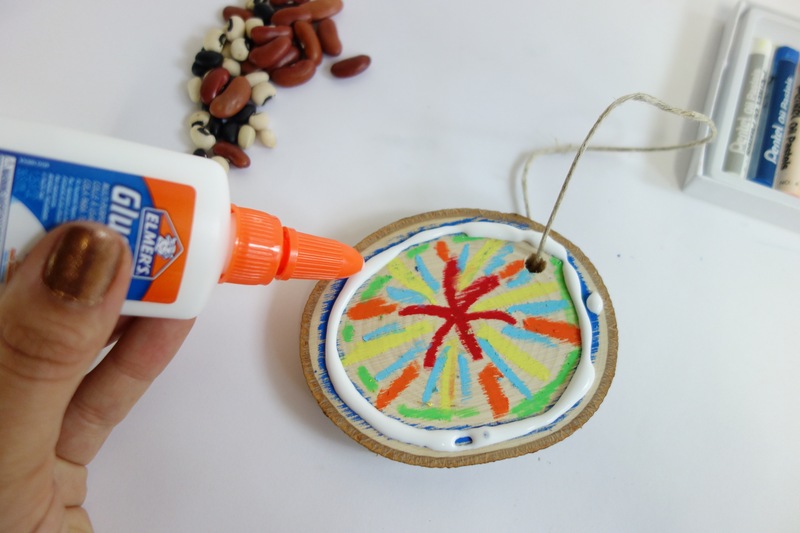 Get ready to feast your eyes on some crafts that will serve as great decorations during your Thanksgiving dinner. 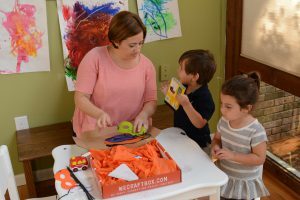 Our November 2017 Box had some fun materials! 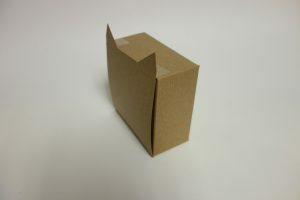 The special art material for the November 2017 Box were the Magic Nuudle Puffs. 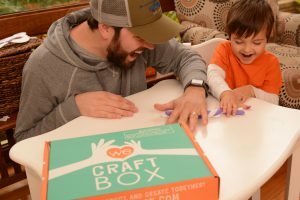 This month’s box had a couple of crafts that were fun for the kids to make and also reminded them of the things that they are thankful for! 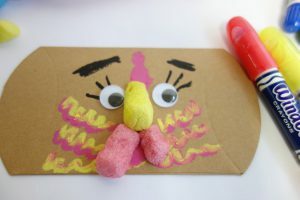 In our first craft we were able to make our Little Turkey Friend! 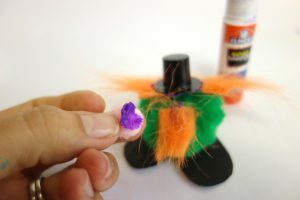 This craft allowed the kids to get really creative making their turkeys. 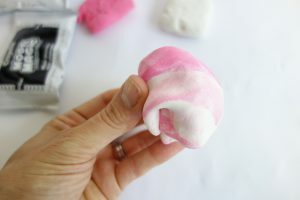 They were able to color it just the way they wanted and add Magic Nuudle Puffs at the size of their choice! 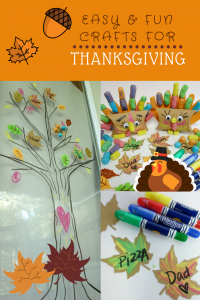 The kids also learned a little about blending colors, as it was suggested to blend the window crayons with your fingers to give the turkey a feathered effect. 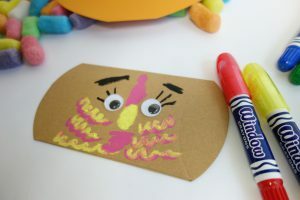 This cute turkey face is irresistible! 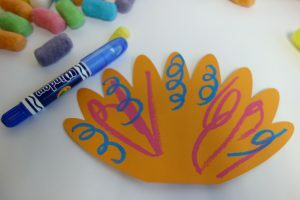 The tail of the turkey was also fun for the kids to decorate, and they were able to draw silly spirals and use some bright colors! 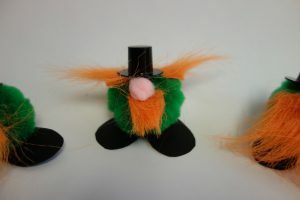 Our Little Turkey Friend was also easy to assemble! 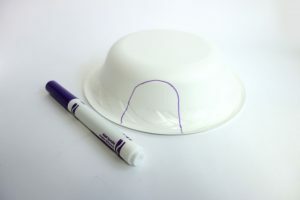 It is also a great decoration for the table, sitting next to the real turkey during Thanksgiving dinner. 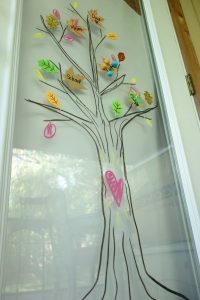 After making Our Little Turkey Friend, we moved onto the Thankful Tree! 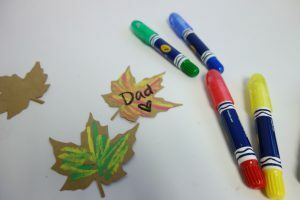 When starting this craft, we made some thankful leaves. 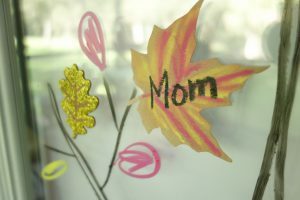 Thankful leaves are simply leaves that have some color added to them and something that you are thankful for are written on them! 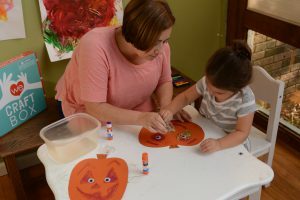 Some examples could me Mom, Dad, Grandpa, or Pumpkin Pie! 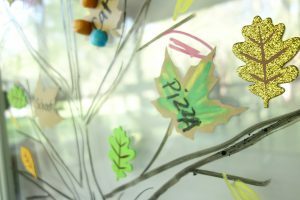 It was a great way for the kids to show what they were thankful for and having fun while doing it! 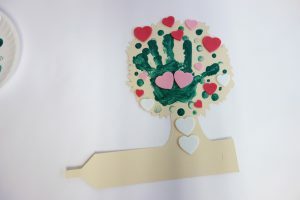 The thankful tree is great for all year round, as there is never a time to stop being thankful for the things you cherish in life. 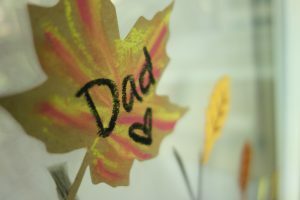 I hope everyone has a safe and happy Thanksgiving and that November brings you many blessings! 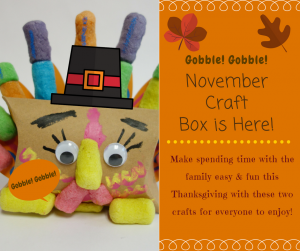 Author Meg FisterPosted on August 26, 2018 September 1, 2018 Categories Past BoxesLeave a comment on We’d Like a Moment to Gobble about our November 2017 Box! 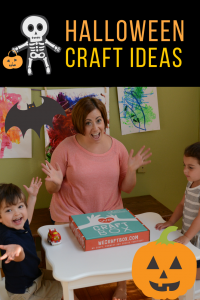 It’s almost that time of year where we start picking out our BOO-tiful pumpkins and silly costumes! 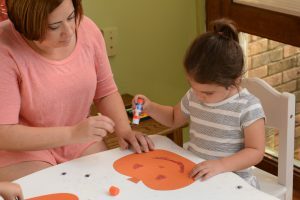 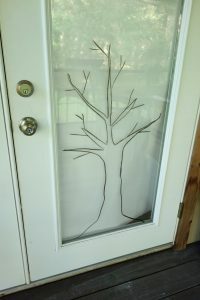 I wanted to share some easy crafts to do with the kids to spook up the house, while avoiding all the pumpkin guts that comes with carving pumpkins. 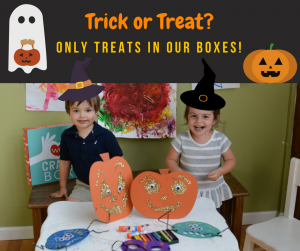 Our October Box had crafts that were silly and great to hang on the fridge or in a window, so all the other trick-or-treaters could see! 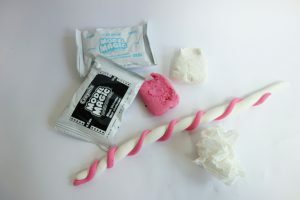 Let’s start out with some of the materials that were in the October 2017 box! 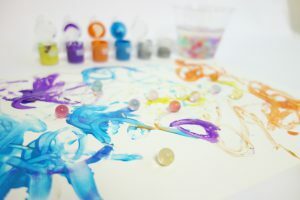 For this month, our special art material was chalk! 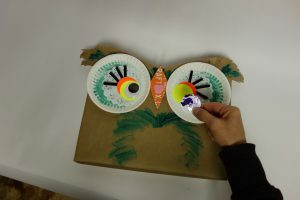 This is a picture of the fun we had unboxing the October 2017 Box and the kids were eager to see what they were going to make. 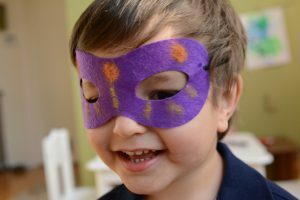 In the craft above, the kids used the chalk to decorate some cloth masks. 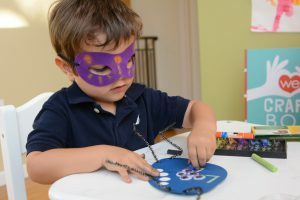 They had a lot of fun making and personalizing their masks the way they wanted. 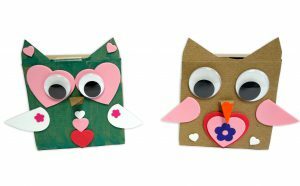 Another plus is that they turned out super cute! 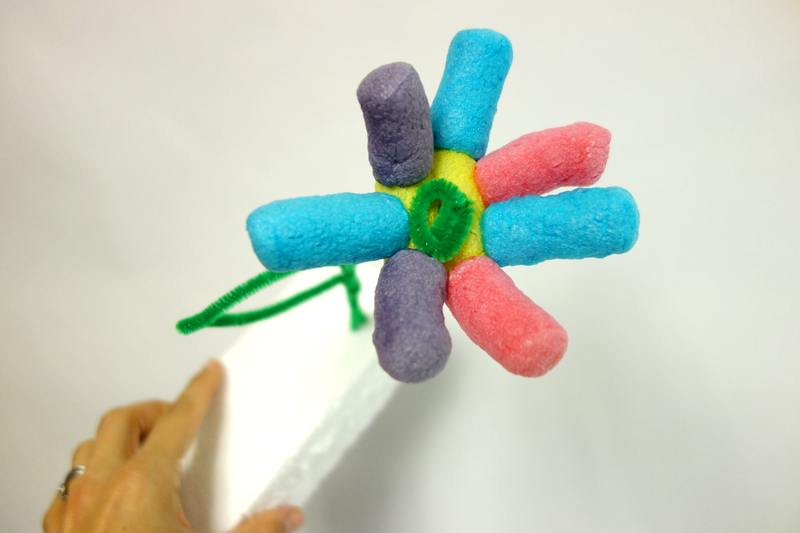 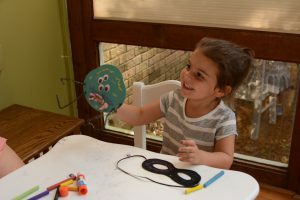 In the next craft that was featured in the October 2017 Box, the kids were able to make and decorate their own spider puppets! 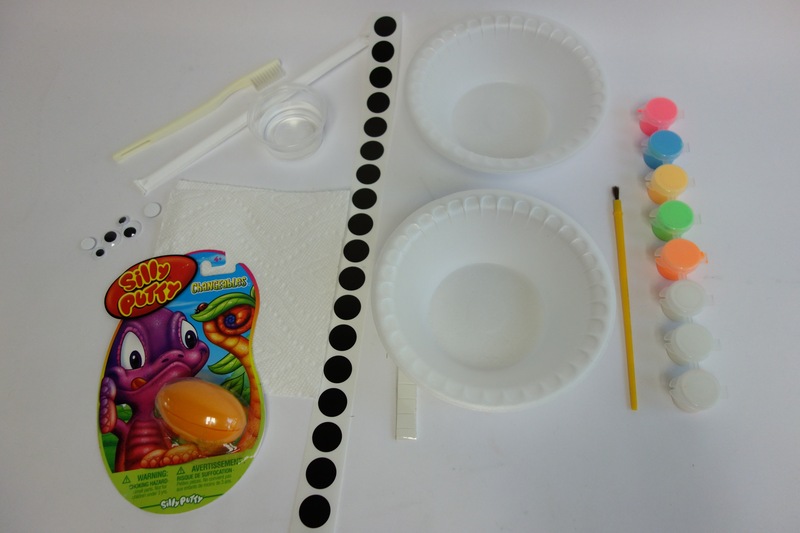 The kids were able to decorate their own spiders with googly eyes and add some color to them with the chalk. 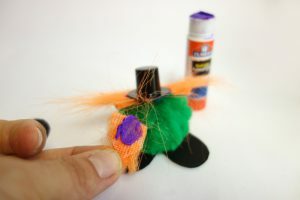 The last craft was my personal favorite, and gave all the other trick-or-treaters pumpkin’ to talk about! 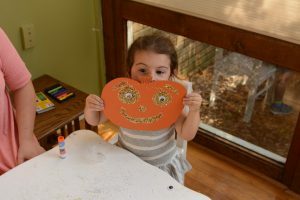 With a little help from the glue stick, the kids were provided with some pumpkin cutouts and were able to bring them to life with a little glitter and some googly eyes! 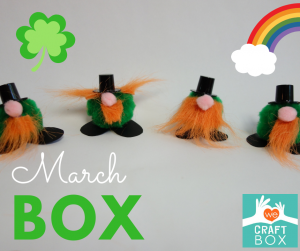 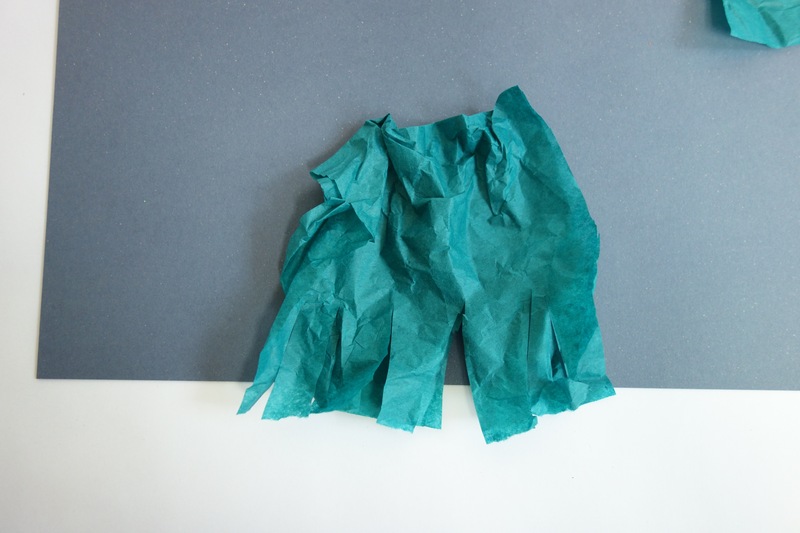 If you like crafts like these, don’t hesitate to try out next month’s box!